Human newborns are exposed to large numbers of bacteria at birth. They must transition from the protective, sterile environment of the womb into the bacteria-rich world. The gut, in particular, must adapt as bacteria colonize it. Many of the first bacteria found in the newborn gut form the basis of the bacterial communities needed for a healthy intestine throughout life. In some premature infants, bacterial colonization of the intestine may trigger harmful inflammation and a serious illness called necrotizing enterocolitis. It is not known exactly how the immature intestine first responds to bacteria. It is also unclear what goes wrong that causes illness in some premature infants. Learning more about how a healthy newborn intestine becomes colonized and responds to this colonization may help medical professionals to better care for normal infants and those who are at risk of intestinal disease. But it has been difficult to study because there is not much newborn intestinal tissue available for scientific research. One solution would be to grow tissue in the laboratory that is like tissue found in the newborn intestine and see how it adapts to bacteria. Now, Hill et al. use stem cells to grow a tissue in the laboratory that is very like immature newborn intestine and show that bacterial colonization helps it to mature. In the experiments, stem cells were grown into an intestine-like tissue. Analyses showed that this laboratory-grown tissue had the same patterns of gene expression as newborn intestines. Then, a type of bacteria called Escherichia coli that is normally found in the intestines of healthy babies was introduced to the intestine-like tissue. Hill et al. show that the initial contact with bacteria and changes in oxygen levels due to bacterial activity cause shifts in gene expression. These in turn stimulate the release of mucus and other protective responses. A protein called NF-κB plays a central role in these normal bacteria-intestine interactions. Hill et al. show that using a drug to block NF-κB interferes with these processes. The experiments show that contact with bacteria encourages the immature intestine to protect itself from potential harm. More experiments like these may help scientists understand normal bacteria-intestine interactions in early life and how they may go wrong in disease. These studies might also help identify new treatments for babies with necrotizing enterocolitis. The epithelium of the gastrointestinal (GI) tract represents a large surface area for host-microbe interaction and mediates the balance between tolerance of mutualistic organisms and the exclusion of potential pathogens (Peterson and Artis, 2014). This is accomplished, in part, through the formation of a tight physical epithelial barrier, in addition to epithelial secretion of antimicrobial peptides and mucus (Veereman-Wauters, 1996; Renz et al., 2011). Development and maturation of the epithelial barrier coincides with the first exposure of the GI tract to microorganisms and the establishment of a microbial community within the gut (Palmer et al., 2007; Koenig et al., 2011). Although microorganisms have long been appreciated as the primary drivers of the postnatal expansion of adaptive immunity (Renz et al., 2011; Shaw et al., 2010; Hviid et al., 2011; Abrahamsson et al., 2014; Arrieta et al., 2015), and more recently as key stimuli in the development of digestion (Erkosar et al., 2015), metabolism (Cho et al., 2012), and neurocognitive function (Diaz Heijtz et al., 2011; Clarke et al., 2014; Borre et al., 2014; Desbonnet et al., 2014), it remains unclear how the human epithelial surface adapts to colonization and expansion of microorganisms within the immature GI tract. Studies in gnotobiotic mice have improved our understanding of the importance of microbes in normal gut function since these mice exhibit profound developmental defects in the intestine (Round and Mazmanian, 2009; Gensollen et al., 2016; Bry et al., 1996; Hooper et al., 1999) including decreased epithelial turnover, impaired formation of microvilli (Abrams et al., 1963), and altered mucus glycosylation at the epithelial surface (Bry et al., 1996; Goto et al., 2014; Cash et al., 2006). However, evidence also suggests that the immature human intestine may differ significantly from the murine intestine, especially in the context of disease (Nguyen et al., 2015). For example, premature infants can develop necrotizing enterocolitis (NEC), an inflammatory disease with unknown causes. Recent reports suggest a multifactorial etiology by which immature intestinal barrier function predisposes the preterm infant to intestinal injury and inflammation following postpartum microbial colonization (Neu and Walker, 2011; Morrow et al., 2013; Greenwood et al., 2014; Hackam et al., 2013; Afrazi et al., 2014; Fusunyan et al., 2001; Nanthakumar et al., 2011). Rodent models of NEC have proven to be inadequate surrogates for studying human disease (Tanner et al., 2015). Therefore, direct studies of host-microbial interactions in the immature human intestine will be important to understand the complex interactions during bacterial colonization that lead to a normal gut development or disease. Important ethical and practical considerations have limited research on the immature human intestine. For example, neonatal surgical specimens are often severely damaged by disease and not conducive for ex vivo studies. We and others have previously demonstrated that human pluripotent stem-cell-derived human intestinal organoids (HIOs) closely resemble immature intestinal tissue (Spence et al., 2011; Finkbeiner et al., 2015; Watson et al., 2014; Forster et al., 2014; Dedhia et al., 2016; Aurora and Spence, 2016; Chin et al., 2017) and recent work has established gastrointestinal organoids as a powerful model of microbial pathogenesis at the mucosal interface (Leslie et al., 2015; McCracken et al., 2014; Forbester et al., 2015; Hill and Spence, 2017). In the current work, we used HIOs as a model immature intestinal epithelium and a human-derived non-pathogenic strain of E. coli as a model intestinal colonizer to examine how host-microbe interactions affected intestinal maturation and function. Although the composition of the neonatal intestinal microbiome varies between individuals, organisms within the genera Escherichia are dominant early colonizers (Gosalbes et al., 2013; Bäckhed et al., 2015) and non-pathogenic E. coli are widely prevalent and highly abundant components of the neonatal stool microbiome (Palmer et al., 2007; Koenig et al., 2011; Bäckhed et al., 2015; Morrow et al., 2013). Microinjection of E. coli into the lumen of three-dimensional HIOs resulted in stable bacterial colonization in vitro, and using RNA-sequencing, we monitored the global transcriptional changes in response to colonization. 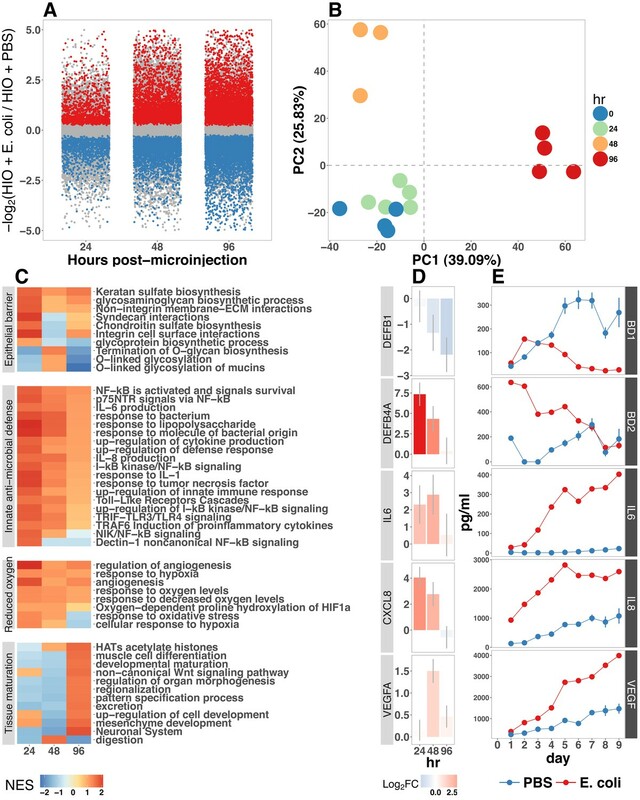 We observed widespread, time-dependent transcriptional responses that are the result of both bacterial contact and luminal hypoxia resulting from bacterial colonization in the HIO. Bacterial association with the immature epithelium increased antimicrobial defenses and resulted in enhanced epithelial barrier function and integrity. We observed that NF-κB is a central downstream mediator of the transcriptional changes induced by both bacterial contact and hypoxia. We further probed the bacterial contact and hypoxia-dependent epithelial responses using experimental hypoxia and pharmacological NF-κB inhibition, which allowed us to delineate which of the transcriptional and functional responses of the immature epithelium were oxygen and/or NF-κB dependent. We found that NF-κB-dependent microbe-epithelial interactions were beneficial by enhancing barrier function and protecting the epithelium from damage by inflammatory cytokines. Collectively, these studies shed light on how microbial contact with the immature human intestinal epithelium can lead to modified function. Previous work has demonstrated that stem-cell-derived human intestinal organoids resemble immature human duodenum (Watson et al., 2014; Finkbeiner et al., 2015; Tsai et al., 2017). Moreover, transplantation into immunocompromised mice results in HIO maturation to an adult-like state (Watson et al., 2014; Finkbeiner et al., 2015). These analyses compared HIOs consisting of epithelium and mesenchyme to whole-thickness human intestinal tissue, which also possessed cellular constituents lacking in HIOs such as neurons, blood vessels and immune cells (Finkbeiner et al., 2015). Thus, the extent to which the HIO epithelium resembles immature/fetal intestinal epithelium remained unclear. To address this gap and further characterize the HIO epithelium relative to fetal and adult duodenal epithelium, we isolated and cultured epithelium from HIOs grown entirely in vitro, from fetal duodenum, adult duodenum, or HIOs that had been transplanted into the kidney capsule of NSG immuno-deficient mice and matured for 10 weeks. These epithelium-only derived organoids were expanded in vitro in uniform tissue culture conditions for 4–5 passages and processed for RNA-sequencing (RNA-seq) (Figure 1—figure supplement 1). Comparison of global transcriptomes between all samples in addition to human embryonic stem cells (hESCs) used to generate HIOs (Finkbeiner et al., 2015; E-MTAB-3158) revealed a clear hierarchy in which both in vitro grown HIO epithelium (p=5.06 × 10-9) and transplanted epithelium (p=7.79 × 10-14) shares a substantially greater degree of similarity to fetal small intestinal epithelium (Figure 1—figure supplement 1A). While unbiased clustering demonstrated that transplanted epithelium closely resembles fetal epithelium, we noted a shift toward the adult transcriptome that resulted in a relative increase in the correlation between transplanted HIO epithelium and adult duodenum-derived epithelium grown in vitro (Figure 1—figure supplement 1B, p=1.17 × 10-4). Principle component analysis (PCA) of this multi-dimensional gene expression dataset (Figure 1—figure supplement 1C) corroborated the correlation analysis, and indicated that PC1 was correlated with developmental stage (PC1, 27.75% cumulative variance) and PC2 was correlated with tissue maturation status (PC2, 21.49% cumulative variance); cumulatively, PC1 and PC2 accounted for 49.24% of the cumulative variance between samples, suggesting that developmental stage and tissue maturation status are major sources of the transcriptional variation between samples. HIO epithelium clustered with fetal epithelium along PC2, whereas transplanted HIO epithelium clustered with adult epithelium. We further used differential expression analysis to demonstrate that in vitro grown HIO epithelium is similar to the immature human intestine, whereas in vivo transplanted HIO epithelium is similar to the adult epithelium. To do this, we identified differentially expressed genes through two independent comparisons: (1) human fetal vs. adult epithelium; (2) HIO epithelium vs. transplanted HIO epithelium. Genes enriched in transplanted HIO epithelium relative to the HIO epithelium were compared to genes enriched in the adult duodenum relative to fetal duodenum (Figure 1—figure supplement 1D). There was a highly significant correlation between log2-transformed expression ratios where transplanted HIOs and adult epithelium shared enriched genes while HIO and fetal epithelium shared enriched genes (p=2.6 × 10-28). This analysis supports previously published data indicating that the epithelium from HIOs grown in vitro recapitulates the gene expression signature of the immature duodenum and demonstrates that the HIO epithelium is capable of adopting a transcriptional signature that more strongly resembles adult duodenum following transplantation into mice. Given that the HIO epithelium recapitulates many of the features of the immature intestinal epithelium, we set out to evaluate the effect of bacterial colonization on the naïve HIO epithelium. Previous studies have established that pluripotent stem-cell-derived intestinal organoids can be injected with live viral (Finkbeiner et al., 2012) or bacterial pathogens (Leslie et al., 2015; Engevik et al., 2015; Forbester et al., 2015); however, it was not known if HIOs could be stably co-cultured with non-pathogenic microorganisms. We co-cultured HIOs with the non-motile human-derived Esherichia coli strain ECOR2 (Ochman and Selander, 1984). Whole genome sequencing and phylogentic analysis demonstrated that E. coli str. ECOR2 is closely related to other non-pathogenic human E. coli and only distantly related to pathogenic E. coli and Shigella isolates (Figure 1—figure supplement 3). We developed a microinjection technique to introduce live E. coli into the HIO lumen in a manner that prevented contamination of the surrounding media (Figure 1—figure supplement 2). HIOs microinjected with 105 live E. coli constitutively expressing GFP exhibit robust green fluorescence within 3 hr of microinjection (Figure 1A and Video 1). Numerous E. coli localized to the luminal space at 48 hr post-microinjection and are present adjacent to the HIO epithelium, with some apparently residing in close opposition to the apical epithelial surface (Figure 1B). HIOs can be stably associated with non-pathogenic E. coli. 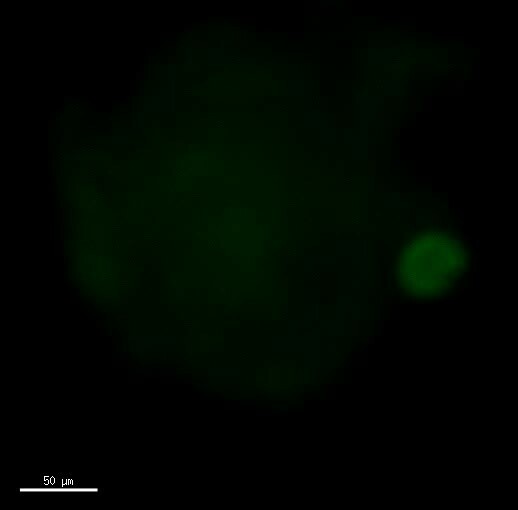 (A) Mean fluorescent intensity of a human intestinal organoid (HIO) containing live GFP+E. coli str. ECOR2. The lower panels show representative images from the time series. Representative of three independent experiments. Video 1 is an animation corresponding to this dataset. (B) Confocal micrograph of the HIO epithelium (E-cadherin) in direct association with GFP+ E. coli at 48 hr post-microinjection with 104 live E. coli. 60X magnification. (C) Luminal CFU per HIO E. coli at 24 hr post-microinjection relative to the injected concentration of 5 × 10-1 to 5 × 105 CFU per HIO at the start of the experiment. N = 10 biological replicates per E. coli dose. The r2 and P value shown in the figure represent the results of a linear regression analysis of the relationship between the 24 hr change in CFU/HIO and the initial number of CFU injected. (D) Luminal CFU per HIO at 0–72 hr following microinjection with 10 CFU E. coli per HIO. N = 13–17 replicate HIOs per time point. The p-value represents the results of a two-tailed Student’s t-test comparing the two conditions indicated. (E) Daily proportion of HIO cultures with no culturable E. coli in the external media following E. coli microinjection (N = 48) or PBS microinjection (N = 8). Animation of individual epifluorescent microscopy images from a human intestinal organoid (HIO) containing live GFP+ E. coli str. ECOR2. Images were captured at 10 min intervals over the course of 18 hr an coalated in sequential order. Representative of three independent experiments. See Figure 1A. In order to determine the minimum number of colony-forming units (CFU) of E. coli required to establish short term colonization (24 hr), we microinjected increasing numbers of live E. coli suspended in PBS into single HIOs and collected and determined the number of bacteria in the luminal contents at 24 hr post-microinjection (Figure 1C). Single HIOs can be stably colonized by as few as 5 CFU E. coli per HIO with 77.8% success (positive luminal culture and negative external media culture at 24 hr post-injection) and 100% success at ≥100 CFU per HIO (Figure 1C). Increasing the number of CFU E. coli microinjected into each HIO at t = 0 did result in a significant increase in the mean luminal CFU per HIO at 24 hr post-microinjection at any dose (ANOVA p=0.37; Figure 1C). Thus, the 24 hr growth rate of E. coli within the HIO lumen (CFU×HIOt=24−1CFU×HIOt=0−1) was negatively correlated with the CFU injected (r2 = 0.625, p=3.1 × 10-12; Figure 1C). Next, we examined the stability of HIO and E. coli co-cultures over time in vitro. HIOs were microinjected with 10 CFU E. coli and maintained for 24–72 hr (Figure 1D). Rapid expansion of E. coli density within the HIO lumen was observed in the first 24 hr, with relatively stable bacterial density at 48–72 hr. A 6.25-fold increase in bacterial density was observed between 24 and 72 hr post-microinjection (p=0.036). Importantly, samples taken from the external HIO culture media were negative for E. coli growth. Finally, we examined the stability of HIO cultures following E. coli microinjection (Figure 1E). A total of 48 individual HIOs were microinjected with 104 CFU E. coli each. Controls were microinjected with sterile PBS alone. We found that external culture media was sterile in 100% of control HIOs throughout the entire experiment, and in 100% of E. coli injected HIOs on days 0–2 post-microinjection. On days 3–9 post-microinjection some cultured media was positive for E. coli growth; however, 77.08% of E. coli injected HIOs were negative for E. coli in the external culture media throughout the timecourse. Additional control experiments were conducted to determine if the HIO growth media had any effect on E. coli growth. E.coli-inoculated HIO growth media showed that the media itself allowed for robust bacterial growth, and therefore the absence of E. coli growth in external media from HIO cultures could not be attributed to the media composition alone (Figure 1—figure supplement 3). Thus, the large majority of E. coli colonized HIOs remain stable for an extended period when cultured in vitro and without antibiotics. Colonization of the immature gut by microbes is associated with functional maturation in both model systems (Kremer et al., 2013; Sommer et al., 2015; Broderick et al., 2014; Erkosar et al., 2015) and in human infants (Renz et al., 2011). To evaluate if exposing HIOs to E. coli led to maturation at the epithelial interface, we evaluated the transcriptional events following microinjection of live E. coli into the HIO lumen. PBS-injected HIOs (controls) and HIOs co-cultured with E. coli were collected for transcriptional analysis after 24, 48 and 96 hr (Figure 2). At 24 hr post-microinjection, a total of 2018 genes were differentially expressed (adjusted-FDR < 0.05), and the total number of differentially expressed genes was further increased at 48 and 96 hr post-microinjection relative to PBS-injected controls (Figure 2A). Principle component analysis demonstrated that global transcriptional activity in HIOs is significantly altered by exposure to E. coli, with the degree of transcriptional change relative to control HIOs increasing over time (Figure 2B). (A) Log2-transformed fold change in normalized RNA-seq gene counts in E. coli colonized HIOs at 24, 48, and 96 hr post-microinjection with 104 live E. coli relative to PBS-injected HIOs. Differentially expressed genes (FDR-adjusted p-value < 0.05) are indicated in red (up-regulated) or blue (down-regulated). Plotted results are the mean fold change per gene for each group. (B) Principle component plot of HIOs at 0–96 hr post-microinjection derrived from whole-transcriptome RNA-seq normalized gene counts. Cumulative explained variance for PC1 and PC2 is indicated as a percentage on the x- and y-axes, respectively. (C) Heat map of normalized enrichment scores (NES) from GSEA of normalized RNA-seq expression data using the GO and REACTOME databases. A positive value of NES indicates activation of a given gene set and a negative value suggests relative suppression of a gene set. All NES scores are calculated relative to PBS-microinjected controls. (D) Mean log2 fold change in normalized RNA-seq gene counts at 24–96 hr post microinjection relative to PBS-injected control HIOs. (E) Protein secretion at 0–9 days post-microinjection with PBS or E. coli as measured by ELISA in the supernatant of HIO cultures. The genes given in D correspond to the proteins measured in E. N = 4 (0 hr), 5 (24 hr), 3 (48 hr), and 4 (96 hr) biological replicates consisting of 5–6 pooled HIOs per replicate for panels A-D. N = 48 E. coli-injected HIOs and N = 8 PBS-injected HIOs for panel E.
Gene set enrichment analysis (GSEA) (Subramanian et al., 2005) using the GO (Ashburner et al., 2000; Gene Ontology Consortium, 2015) and REACTOME (Croft et al., 2014; Fabregat et al., 2016) databases to evaluate RNA-seq expression data revealed coordinated changes in gene expression related to innate anti-microbial defense, epithelial barrier production, adaptation to low oxygen, and tissue maturation (Figure 2C). Innate antimicrobial defense pathways, including genes related to NF-κB signaling, cytokine production, and Toll-like receptor (TLR) signaling were strongly up-regulated at 24 hr post-microinjection and generally exhibited decreased activation at later time points. GSEA also revealed changes in gene expression consistent with reduced oxygen levels or hypoxia, including the induction of pro-angiogenesis signals. A number of pathways related to glycoprotein synthesis and modification, including O-linked mucins, glycosaminoglycans, and proteoglycans, were up-regulated in the initial stages of the transcriptional response (Syndecans, integrins), exhibited a somewhat delayed onset (O-linked mucins), or exhibited consistent activation at all time points post-microinjection (Keratan sulfate and glycosaminoglycan biosynthesis). Finally, genes sets associated with a range of processes involved in tissue maturation and development followed a distinct late-onset pattern of expression. This included broad gene ontology terms for organ morphogenesis, developmental maturation, and regionalization as well as more specific processes such as differentiation of mesenchymal and muscle cells, and processes associated with the nervous system (Figure 2C). We also made correlations between upregulated genes in the RNA-seq data (Figure 2D) and protein factors present in the organoid culture media following E. coli microinjection (Figure 2E). β-defensin 1 (DEFB1 (gene); BD-1 (protein)) and β-defensin 2 (DEFB4A (gene); BD-2 (protein)) exhibited distinct patterns of expression, with both DEFB1 and its protein product BD-1 stable at 24 hr after E. coli microinjection but relatively suppressed at later time points, and DEFB4A and BD-2 strongly induced at early time points and subsiding over time relative to PBS-injected controls. By contrast, inflammatory regulators IL-6 and IL-8 and the pro-angiogenesis factor VEGF were strongly induced at the transcriptional level within 24–48 hr of E. coli microinjection. Secretion of IL-6, IL-8, and VEGF increased over time, peaking at 5–9 days after E. coli association relative to PBS-injected controls (Figure 2E). Taken together, this data demonstrates a broad-scale and time-dependent transcriptional response to E. coli association with distinct early- and late-phase patterns of gene expression and protein secretion. While the transcriptional analysis demonstrated strong time-dependent changes in the cells that comprise the HIO following E. coli colonization, we hypothesized that exposure to bacteria may also alter the cellular behavior and/or composition of the HIO. Previous studies have demonstrated that bacterial colonization promotes epithelial proliferation in model organisms (Bates et al., 2006; Cheesman et al., 2011; Neal et al., 2013; Kremer et al., 2013; Ijssennagger et al., 2015). We examined epithelial proliferation in HIOs over a timecourse of 96 hr by treating HIOs with a single 2 hr exposure of 10 μM EdU added to the culture media from 22 to 24 hr after microinjection with 104 CFU E. coli or PBS alone. HIOs were subsequently collected for immunohistochemistry at 24, 48, and 96 hr post-microinjection (Figure 3). The number of proliferating epithelial cells (Edu\+ and E-cadherin\+) was elevated by as much as three-fold in E. coli-colonized HIOs relative to PBS-treated HIOs at 24 hr (Figure 3A–B). However, at 48 hr post-microinjection, the proportion of EdU + epithelial cells was significantly decreased in E. coli colonized HIOs relative to control treated HIOs. This observation was supported by another proliferation marker, KI67 (Gerdes et al., 1984)(Figure 3B), as well as RNA-seq data demonstrating an overall suppression of cell cycle genes in E. coli colonized HIOs relative to PBS-injected HIOs at 48 hr post-microinjection (Figure 3—figure supplement 1). By 96 hr post-microinjection the proportion of EdU+ epithelial cells was nearly identical in E. coli and PBS-treated HIOs (Figure 3B). Collectively, these results suggest that E. coli colonization is associated with a rapid burst of epithelial proliferation, but that relatively few of the resulting daughter cells are retained subsequently within the epithelium. Bacterial colonization results in a transient increase in epithelial proliferation and the maturation of enterocytes. (A) Representative confocal micrographs of HIOs injected with PBS or 104 CFU E. coli str. ECOR2 at 24–96 hr post-microinjection and stained with fluorescent indicators for for EdU+DNA, E-cadherin, or nuclei (DAPI) as indicated in the figure labels . All HIOs were exposed to 10 μM EdU at 22 hr post-microinjection and EdU was removed at 24 hr. Panels are representative of 4 HIOs per timepoint per treatment condition. (B) Quantification of the number of EdU-positive and Ki67-positive epithelial cells (E-cadherin+ cells) per 10X confocal microscopy field. One 10X confocal microscopy field consisting of 200–1000 epithelial cells was collected from each of 4 HIOs per timepoint per treatment group. The error bars represent the standard error of the mean and the p-values reflect the results of an unpaired two-tailed Student’s t-test comparing the PBS-injected HIOs to the E. coli-injected HIOs at that timepoint. (C) Representative confocal micrographs of HIOs injected with PBS or 104 CFU E. coli str. ECOR2 at 24–96 hr post-microinjection and stained with fluorescent antibodies for Sox9, E-cadherin, or nuclei (DAPI) as indicated in the figure labels. Panels are representative of 4 HIOs per timepoint per treatment condition. The transcription factor Sox9 is expressed by progenitor cells in the murine intestinal epithelium (Bastide et al., 2007; Mori-Akiyama et al., 2007), and several epithelial subtypes are derived from a Sox9-expressing progenitor population in the mature intestinal epithelium (Bastide et al., 2007; Furuyama et al., 2011). We examined SOX9 expression in HIOs following microinjection with E. coli or PBS alone over a 96 hr time course (Figure 3C). In the PBS-treated HIOs, the majority of epithelial cells exhibited robust nuclear SOX9 expression at all time points examined. However, SOX9 expression was dramatically reduced in E. coli-colonized HIOs at 48–96 hr after microinjection and was notably distributed in nuclei farthest from the lumen and adjacent to the underlying mesenchyme, mirroring the altered distribution of EdU + nuclei seen in Figure 3B. This observation suggests that there is a reduction in the number of progenitor cells in the HIO epithelium following E. coli colonization and implies that other epithelial types may account for a greater proportion of the HIO epithelium at later time points post-colonization. We saw no appreciable staining for epithelial cells expressing goblet, Paneth, or enteroendocrine cell markers (MUC2, DEFA5, and CHGA, respectively; negative data not shown). However, expression of the small intestinal brush border enzyme dipeptidyl peptidase-4 (DPPIV) was found to be robustly expressed in the E. coli-colonized HIOs at 48 and 96 hr post-microinjection (Figure 3D). DPPIV was not detected in any of the PBS-injected HIOs at any timepoint. Lysozyme (LYZ), an antimicrobial enzyme expressed by Paneth-like progenitors in the small intestinal crypts Bevins and Salzman (2011), was widely distributed throughout the epithelium of PBS-treated HIOs as we have previously described (Spence et al., 2011) (Figure 3D). However, in E. coli-colonized HIOs, LYZ expression was restricted to distinct clusters of epithelial cells and, notably, never overlapped with DPPIV staining (Figure 3D). Given that bona fide Paneth Cell markers (i.e. DEFA5) were not observed in any HIOs, it is likely that the LYZ expression is marking a progenitor-like population of cells. Taken together, these experiments indicate that E. coli colonization induces a substantial but transient increase in the rate of epithelial proliferation followed by a reduction and redistribution of proliferating epithelial progenitors and differentiation of a population of cells expressing small intestinal enterocyte brush boarder enzymes over a period of 2–4 days. The mature intestinal epithelium is characterized by a steep oxygen gradient, ranging from 8% oxygen within the bowel wall to <2% oxygen in the lumen of the small intestine (Fisher et al., 2013). Reduction of oxygen content in the intestinal lumen occurs during the immediate perinatal period (Gruette et al., 1965), resulting in changes in epithelial physiology (Glover et al., 2016; Kelly et al., 2015; Colgan et al., 2013; Zeitouni et al., 2016) that helps to shape the subsequent composition of the microbiota (Schmidt and Kao, 2014; Espey, 2013; Albenberg et al., 2014; Palmer et al., 2007; Koenig et al., 2011). Analysis of the global transcriptional response to E. coli association in the immature intestinal tissue revealed pronounced and coordinated changes in gene expression consistent with the onset of hypoxia (Figure 2C–E). We therefore measured oxygen concentration in the lumen of control HIOs and following microinjection of live E. coli using a 50 μm diameter fiberoptic optode (Figure 4A–B). Baseline oxygen concentration in the organoid lumen was 8.04 ± 0.48%, which was significantly reduced relative to the external culture media (18.86 ± 0.37%, p=3.6 × 10-11). At 24 and 48 hr post-microinjection, luminal oxygen concentration was significantly reduced in E. coli-injected HIOs relative to PBS-injected HIOs (p=0.04 and p=5.2 × 10-05, respectively) reaching concentrations as low as 1.67 ± 0.62% at 48 hr (Figure 4A). E. coli injected HIOs were collected and CFU were enumerated from luminal contents at 24 and 48 hr post-microinjection. We observed a highly significant negative correlation between luminal CFU and luminal oxygen concentration where increased density of luminal bacteria was correlated with lower oxygen concentrations (r2 = 0.842, p=6.86 × 10-5; Figure 4B). Finally, in order to assess relative oxygenation in the epithelium itself, we utilized a small molecule pimonidazole (PMDZ), which forms covalent conjugates with thiol groups on cytoplasmic proteins only under low-oxygen conditions (Arteel et al., 1998). Fluorescent immunochemistry demonstrated enhanced PMDZ uptake in E. coli associated HIO epithelium, and in HIOs grown in 1% O2 as a positive control when compared to to PBS-injected HIOs, or HIOs injected with heat killed E. coli at 48 hr post-microinjection (Figure 4C). Thus, luminal and epithelial oxygen is reduced following microinjection of E. coli into the HIO, consistent with data in mice showing that the in vivo epithelium is in a similar low-oxygen state in normal physiological conditions (Schmidt and Kao, 2014; Kelly et al., 2015; Kim et al., 2017). E. coli colonization is associated with a reduction in luminal oxygen concentration. (A) Luminal oxygen concentration in human intestinal organoids at 0–48 hr post-microinjection with 104 CFU live E. coli. p Values reflect results of unpaired one-tailed Students t-tests for the comparisons indicated. N = 6–11 replicate HIOs per treatment group per time point. (B) Linear regression analysis of luminal CFU E. coli per organoid at and luminal oxygen concentration in the same organoid 24 hr post-microinjection . (C) Confocal micrographs of the HIO epithelium in PBS- and E. coli-injected HIOs at 48 hr post-microinjection. Images are representative of the replicates detailed in the table, with 12–14 replicate HIOs per treatment group pooled from two separate experiments. Individual HIOs were scored as PMDZ+ or PMDZ- based on the presence or absence, respectively, of PMDZ conjugates as detected by immunofluorescent microscopy. p-Values represent the results of χ2 contingency tests comparing the distribution of PMDZ+ and PMDZ- HIOs in the PBS-treated group to each of the other conditions. 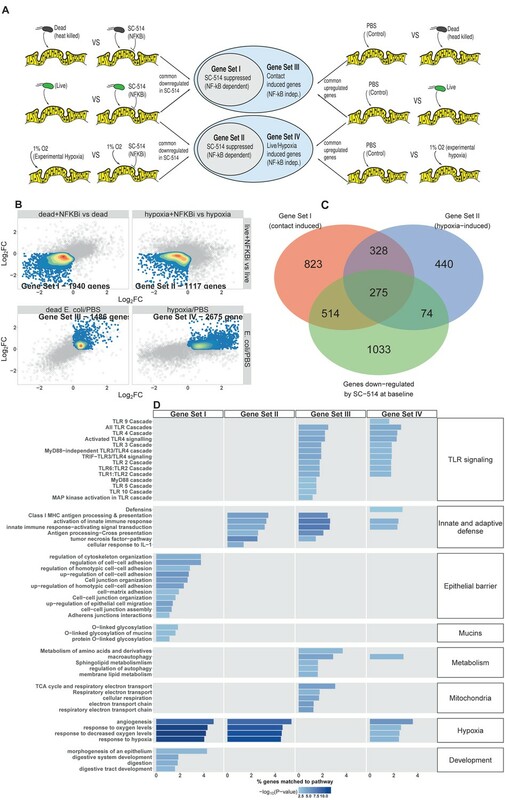 E. coli colonization elicits a robust transcriptional response in immature intestinal tissue (Figure 2) that is associated with the onset of luminal oxygen depletion and relative tissue hypoxia (Figure 4). We set out to determine whether we could assign portions of the transcriptional response to direct interaction with microbes or to the subsequent depletion of luminal oxygen. In the RNA-seq analysis (Figure 2), NF-κB signaling emerged as a major pathway involved in this complex host-microbe interaction, and NF-κB has been shown by others to act as a transcriptional mediator of both microbial contact and the response to tissue hypoxia (Rius et al., 2008; Gilmore, 2006; Wullaert et al., 2011). Gene Ontology and REACTOME pathway analysis showed that NF-κB signaling components are also highly up-regulated following microinjection of E. coli into HIOs (Figure 2C and Figure 5—figure supplement 1A). Thus, we assessed the role of NF-κB signaling in the microbial contact-associated transcriptional response and the hypoxia-associated response using the highly selective IKKβ inhibitor SC-514 (Kishore et al., 2003; Litvak et al., 2009) to inhibit phosphorylation and activation of the transcription factor p65 (Figure 5—figure supplement 1B). Another set of HIOs was simultaneously transferred to a hypoxic chamber and cultured in 1% O2 with and without SC-514. At 24 hr post-treatment, HIOs were harvested for RNA isolation and RNA-seq. We devised an experimental scheme that allowed us to parse out the relative contributions of microbial contact and microbe-associated luminal hypoxia in the transcriptional response to association with live E. coli (Figure 5A and Figure 5—figure supplement 1C). First, we identified a set of genes significantly up-regulated (log2FC > 0 and FDR-adjusted p-value < 0.05) by microinjection of either live E. coli or heat-inactivated E. coli (contact dependent genes). From this gene set, we identified a subset that was suppressed by the presence of NF-κB inhibitor SC-514 during association with either live or heat-inactivated E. coli (log2FC < 0 and FDR-adjusted p-value < 0.05; Gene Set I, Figure 5B). Thus, Gene Set I represents the NF-κB dependent transcriptional response to live or dead E. coli. Genes induced by live or heat-inactivated E. coli but not suppressed by SC-514 were considered NF-κB independent (Gene Set III, Figure 5B). Likewise, we compared genes commonly up-regulated by association with live E. coli and those up-regulated under 1% O2 culture conditions. A subset of genes induced by either live E. coli or 1% O2 culture but suppressed by the presence of NF-κB inhibitor was identified as the NF-κB-dependent hypoxia-associated transcriptional response (Gene Set II, Figure 5B). Genes induced by live E. coli or hypoxia but not inhibited by the presence of NF-κB inhibitor were considered NF-κB independent transcriptional responses to microbe-associated hypoxia (Gene Set IV). Gene lists for each gene set are found in Supplementary file 1. NF-κB integrates complex microbial and hypoxic stimuli. (A) Analysis scheme for identifying genes sets representing the components of the transcriptional response to live E. coli that could be recapitulated with heat-inactivated E. coli (contact induced) or hypoxia (microbial-associated hypoxia induced) as well as the subsets of genes induced through NF-κB dependent signaling. HIOs were microinjected with PBS, 104 CFU E. coli or an equivalent concentration of heat-inactivated E. coli and cultured under standard cell culture conditions or hypoxic conditions (1% O2, 5% CO2, 94% N2) with and without 10 μM SC-514. (B) Scatter plots with density overlay indicating the genes meeting the a priori criteria identified in panel A with an FDR-adjusted p-value of < 0.05 for the comparisons listed on the axes of the plot. (C) Bar plot of the proportion of genes in the input gene sets mapping to each pathway from the GO and REACTOME databases enrichment p-values for each of the gene sets identified in A. Pathways with enrichment p-values > 0.01 were excluded from the plot. Results represent N = 4–5 biological replicates per treatment condition, with each replicate consisting of 5–6 pooled and identically treated HIOs. Following the identification of these four gene sets, we then applied over-representation analysis using the GO and REACTOME pathway databases to identify enriched pathways for each of the four gene sets, resulting in four clearly distinguishable patterns of gene pathway enrichment (Figure 5C). Contact with either live or heat-inactivated E. coli is sufficient to promote expression of genes involved in maintaining epithelial barrier integrity and mucin production, an effect that is suppressed in the presence of NF-κB inhibitor. Additionally, key developmental pathways including epithelial morphogenesis, digestive tract development, and expression of digestive enzymes appear to be driven primarily by bacterial association and are largely NF-κB dependent. Robust innate and adaptive defense requires both bacterial contact and hypoxia, with some genes associated with antigen processing and cytokine signaling being NF-κB dependent (Gene Set II) and others associated with NF-κB-independent gene sets (Gene Sets III and IV). Genes associated with antimicrobial defensin peptides were enriched only in the hypoxia-asociated, NF-κB-independent gene set (Gene Set IV), suggesting that antimicrobial peptides are regulated by mechanisms that are distinct from other aspects of epithelial barrier integrity such as mucins and epithelial junctions (Gene Set I). TLR signaling components were is broadly enhanced by live E. coli and associated with both microbial contact and hypoxia were largely NF-κB independent (Gene Sets III and IV). There was a notable transcriptional signature suggesting metabolic and mitochondrial adaptation to bacteria that was independent of NF-κB and primarily driven by bacterial contact rather than hypoxia (Gene Set III). To interrogate the transcriptional changes influenced by SC-514 exposure, we examined over-represented genes sets from the GO and REACTOME databases in genes that were significantly up- or down-regulated by treatment with SC-514 alone (Figure 5—figure supplement 1C and D) . Notably, SC-514 alone does not appear to have a strong effect on the pathways identified in Figure 5C as key NF-κB-dependent responses to bacterial contact and/or hypoxia. In Figure 5—figure supplement 1E, we examined the degree of overlap between Gene Set I, Gene Set II, and the set of genes that are significantly down-regulated in PBS-injected HIOs treated with SC-514. This analysis demonstrates that the majority of genes in Set I and Set II are not significantly down-regulated in PBS-injected HIOs treated with SC-514. The most significant effects of SC-514 alone among Gene Set I and Gene Set II genes are related to metabolism, redox state, and ribosomal dynamics (Figure 5—figure supplement 1F). Thus, the effect of SC-514 alone cannot account for the NF-κB-dependent changes in innate and adaptive defense, epithelial barrier integrity, angiogenesis and hypoxia signaling, or intestinal development following bacterial contact and/or hypoxia during colonization. Finally, we also examined the role of microbial contact and hypoxia in colonization-induced changes in AMP, cytokine, and growth factor secretion using ELISA (Figure 5—figure supplement 2). Consistent with findings from the RNA-seq data, these results indicate that there are diverse responses to bacterial contact and hypoxia. We observed cases where cytokines were induced by either microbial contact or hypoxia alone (IL-6), other cases where hypoxia appeared to be the dominant stimuli (BD-1), and a third regulatory paradigm in which the response to live E. coli evidently results from the cumulative influence of bacterial contact and hypoxia (BD-2, IL-8, VEGF). Taken together, this analysis demonstrates that association of immature intestinal epithelium with live E. coli results in a complex interplay between microbial contact and microbe-associated hypoxia-induced gene expression and protein secretion. Antimicrobial peptides (AMPs) are key effectors for innate defense of epithelial surfaces (Muniz et al., 2012) and act to inhibit microbial growth through direct lysis of the bacterial cell wall and modulation of bacterial metabolism (Ganz, 2003; Bevins and Salzman, 2011; O'Neil and O’Neil, 2003; Vora et al., 2004; Brogden, 2005). Defensin gene expression is highly up-regulated following microinjection of E. coli into HIOs (Figures 2D–E and and 4C). Using an annotated database of known AMPs (Wang et al., 2016) to query our RNA-seq datasets, we found that several AMPs are up-regulated in the immature intestinal epithelium following E. coli association (Figure 6A). 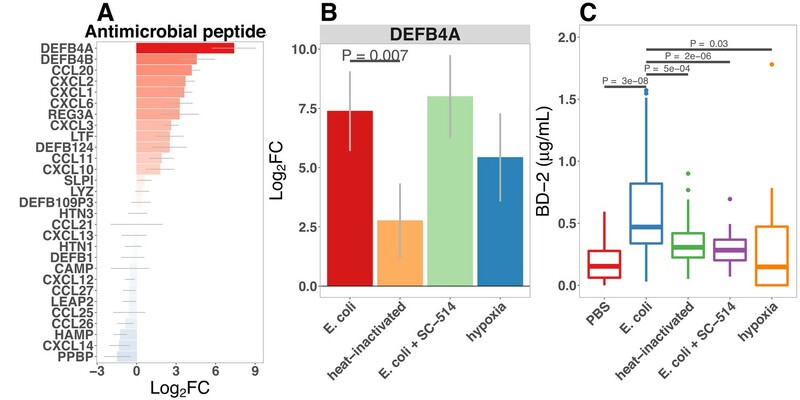 Among these, DEFB4A and DEFB4B, duplicate genes encoding the peptide human β-defensin 2 (Harder et al., 1997), were the most highly up-regulated; other AMPs induced by E. coli association included multi-functional peptides CCL20, CXCL2, CXCL1, CXCL6, CXCL3, REG3A (Cash et al., 2006), and LTF (Figure 6A). Analysis of RNA-seq data from HIOs microinjected with live or heat-killed E .coli with and without NF-κB inhibitor or culture of HIOs under hypoxic conditions had indicated that defensin genes were enriched among the set of NF-κB-independent genes induced by hypoxia (Figure 5C). We examined DEFB4A expression specifically (Figure 6B) and found that relative to control treatment, microinjection of live E. coli resulted in a 7.38-fold increase in normalized DEFB4A expression. Consistent with the notion that DEFB4A expression is induced by hypoxia and is not dependent on NF-κB signaling, NF-κB inhibitor treated HIOs injected with E. coli still showed an ~8-fold increase in gene expression and hypoxia-cultured HIOs showed a ~5.5-fold induction (Figure 6B). On the other hand, microinjection with heat-inactivated E. coli resulted in DEFB4A induction that was significantly lower relative to microinjection with live E. coli (p=0.007. A similar pattern of expression was observed for DEFB4B (Figure 6—figure supplement 1). Bacterial colonization promotes secretion of antimicrobial peptides. (A) Normalized fold change in antimicrobial peptide (AMP) gene expression in E. coli-associated HIOs at 24 hr relative to PBS control treatment. (B) Normalized fold change in expression of DEFB4A, the gene encoding human β-defensin 2 (BD-2) peptide, in each of the conditions indicated relative to PBS control treatment. Results in panels A and B represent N = 4–5 biological replicates per treatment condition, with each replicate consisting of 5–6 pooled and identically treated HIOs. (C) Concentration of BD-2 peptide in culture supernatant at 24 hr as measured by ELISA in HIO cultures treated as indicated. N = 10–14 individually treated HIOs per treatment condition with data combined from three independant replicate experiments. (D) Optical density (600 nm) of E. coli suspension cultures supplemented with PBS or BD-2 at 10-min intervals over an 18 hr period at 37. (E) Carrying capacity (K) of media supplemented with varying concentrations of BD-2 derrived from the growth curves presented in panel D. N = 8 biological replicates per treatment group for panels D and E. p-Values represents the results of a two-tailed Student’s t-test for the comparisons indicated. We also examined secretion of human β-defensin 2 peptide (BD-2) in the supernatant of E. coli-associated HIOs (Figure 2E and Figure 6C). BD-2 secretion was increased 3.4-fold at 24 hr following E. coli microinjection (p=2.7 × 10-8). However, heat-inactivation of E. coli or addition of NF-κB inhibitor resulted in suppression of BD-2 secretion relative to live E. coli (p=0.00051 and 1.6 × 10-6, respectively). To determine if the levels of BD-2 produced by HIOs and secreted into the media were sufficient to retard bacterial growth, we tested the effect of BD-2 at concentrations recapitulating the baseline state in the HIO (~0.1 μg/ml) and following microinjection with E.coli (~1 μg/ml) on in vitro growth of E. coli over 18 hr (Figure 6D). Although there was little effect on E. coli density during initial log-phase growth, BD-2 reduced the amount of time bacteria spent in log-phase growth, and E. coli density was significantly decreased over time in bacterial growth media supplemented BD-2 (p=0.001), resulting in a significant decrease in the effective in vitro carrying capacity, or maximum population density (Figure 6E, p=8 × 10-4). Furthermore, concentrations of BD-2 consistent with those found in HIO/E. coli supernatant (1 μg/ml) was significantly more inhibitory than low concentration BD-2 (0.1 μg/ml) in our in vitro growth assay (p=0.013). Additional data suggest that the inhibitory activity of BD-2 in vitro is not specific to E. coli str. ECOR2 and is dependent upon maintenance of BD-2 protein structure, since BD-2 similarly inhibited growth of E. coli str. K12, and heat-inactivated BD-2 lost these inhibitory effects (Figure 6—figure supplement 2). From this set of experiments, we conclude that E. coli colonization promotes enhanced expression of AMPs, including BD-2, at concentrations that are sufficient to suppress microbial growth. Mucins are an essential component of epithelial integrity, serving as a formidable barrier to microbial invasion and repository for secreted AMPs (Bergstrom and Xia, 2013; Cornick et al., 2015; Johansson and Hansson, 2016; Kim and Ho, 2010). Mucin synthesis requires a complex series of post-translational modifications that add high-molecular-weight carbohydrate side chains to the core mucin protein (Varki, 2017). Our RNA-seq data suggested that mucin gene expression is dependent on both bacterial contact and NF-κB signaling (Figure 5C). Therefore, we examined expression of genes in control and E. coli microinjected HIOs that encode mucin core proteins as well as the glycotransferases that generate the wide variety of post-translational mucin modifications (Figure 7A). Although some glycotransferases were increased at 24 hr after E. coli microinjection, expression of mucin core proteins and many glycotransferases reached peak levels at 48 hr after the introduction of E. coli to the HIO lumen (Figure 7A). Periodic Acid-Schiff and Alcian blue staining (PAS/AB) of sections taken from HIOs at 48 hr after E. coli microinjection reveal the formation of a robust mucin layer at the apical epithelial surface consisting of both acidic (AB-positive) and neutral (PAS-positive) glycoprotein components, suggesting a rich matrix of O-linked mucins, glycosaminoglycans, and proteoglycans (Figure 7B–C). Interestingly, we observed that E. coli association caused an initial induction of MUC5AC at 48 hr that was reduced by 96 hr (Figure 7A). MUC5AC is most highly expressed within the gastric mucosa but has also been reported in the duodenal epithelium (Buisine et al., 1998, 2001; Rodríguez-Piñeiro et al., 2013). On the other hand, MUC2 is more commonly associated with the duodenum, and increased more slowly, showing peak expression after 96 hr of association with E. coli (Figure 7A). Co-staining of control HIOs and E. coli microinjected HIOs demonstrated colocalization with Ulex europaeus agglutinin I (UEA1), a lectin with high specificity for the terminal fucose moiety Fucα1-2Gal-R (Figure 7D). This suggests that following E. coli association, HIOs produce mucins with carbohydrate modifications associated with bacterial colonization in vivo (Cash et al., 2006; Hooper et al., 1999; Goto et al., 2014). Bacterial colonization promotes expression of epithelial mucins and glycotransferases. (A) Heatmap of normalized RNA-seq glycotransferase and mucin gene counts of HIOs associated with E.coli at 0–96 hr post-microinjection. N = 4 (0 hr), 5 (24 hr), 3 (48 hr), and 4 (96 hr) biological replicates consisting of 5–6 pooled HIOs per replicate. (B) Periodic acid-Schiff and Alcian Blue (PAS-AB) staining of control HIOs or HIOs microinjected with E. coli and cultured for 48 hr at 10X magnification. (C) HIO epithelium from control HIOs or HIOs microinjected with E. coli and cultured for 48 hr stained with H and E, AB, PAS, or PAS-AB and imaged under 100X light microscopy. (D) Confocal micrograph of HIO epithelium from a control HIO or an HIO microinjected with E. coli and cultured for 48 hr. Nuclei are stained blue with DAPI, and fluorescent antibody-labeled proteins E-cadherein and Mucin 5 AC are pseudocolored in white or red, respectively. UEA1 lectin is used to label the carbohydrate moiety Fucα1-2Gal-R, which is pseudo colored in green. 60X optical magnification. (E) Heatmap of normalized RNA-seq glycotransferase and mucin gene counts of HIOs associated with live or heat-inactivated E. coli, E. coli + NF-κB inhibitor (SC-514) or HIOs cultured under hypoxic conditions for 24 hr. Results represent the mean of N = 4–5 biological replicates per treatment condition, with each replicate consisting of 5–6 pooled and identically treated HIOs. (F) PAS-AB staining of HIOs treated as indicated in the figure labels for 24 hr. 10X magnification. Histological and immunofluorescent images in panels B-D and F are representative of three or more independent experiments, each consisting of 5–10 HIOs per treatment group. RNA-seq data suggested that O-linked mucins were highly enriched among the subset of genes induced by bacterial contact in an NF-κB-dependent manner (Figure 5). We examined this phenomenon at the level of individual glycosyltransferase and mucin genes (Figure 7E). E. coli induced transcription of mucins and glycosyltransferases (Figure 7E) and mucin secretion (Figure 7—figure supplement 1) was suppressed in the presence of NF-κB inhibitor SC-514. Furthermore, culture of HIOs under hypoxia conditions was not sufficient to promote transcription of genes involved in mucin synthesis (Figure 7E). This result was confirmed with PAS/AB staining of HIOs microinjected with PBS, live or heat-inactivated E. coli, or cultured under hypoxic conditions for 24 hr, where bacterial contact promoted formation of a mucus layer while PBS microinjection or culture under hypoxic conditions did not (Figure 7F). Taken together, these results indicate that association of the immature intestinal epithelium with E. coli promotes robust mucus secretion through an NF-κB-dependent mechanism and that hypoxia alone is not sufficient to recapitulate E. coli-induced mucus production. Having established that the immature intestinal epithelium in HIOs (Figure 1—figure supplement 1) can be stably associated with non-pathogenic E. coli (Figure 1), resulting in broad changes in transcriptional activity (Figure 2) and leading to elevated production of AMPs (Figure 6) and epithelial mucus secretion (Figure 7), we hypothesized that these changes in gene and protein expression would have functional consequences for the immature epithelial barrier. RNA-seq analysis demonstrated broad up-regulation of transcription in genes involved in the formation of the adherens junction and other cell-cell interactions in HIOs after microinjection with live E. coli that was inhibited in the presence of NF-κB inhibitor SC-514 (Figure 8A). We utilized a modified FITC-dextran permeability assay (Leslie et al., 2015) and real-time imaging of live HIO cultures to measure epithelial barrier function in HIOs microinjected with PBS, live E. coli, or live E. coli +SC-514 at 24 hr after microinjection (Figure 8B). While HIOs microinjected with PBS or E. coli retained 94.1 0.3% of the FITC-dextran fluorescence over the 20-hr assay period, E. coli microinjected HIOs cultured in the presence of SC-514 retained only 45.5 ± 26.3% of the fluorescent signal (p=0.02; Figure 8B). We also measured the rate of bacterial translocation across the HIO epithelium, which resulted in contaminated culture media (Figure 8C). HIOs microinjected with E. coli and treated with SC-514 were compared to E. coli microinjected HIOs treated with vehicle (DMSO controls) and PBS microinjected controls over 7 days in culture. HIOs associated with E. coli +SC-514 exhibited a rapid onset of bacterial translocation by days 2–3, with bacterial translocation detected in 96% of SC-514-treated HIOs by day 7 compared to 23% of HIOs microinjected with E. coli and cultured in DMSO (P=<2 × 10-16; Figure 8C). Therefore, blocking NF-κB signaling inhibited epithelial barrier maturation resulting in increased bacterial translocation during E. coli association with the immature epithelium. Bacterial colonization promotes resilience of the epithelial barrier via NF-κB. (A) Heatmap of RNA-seq data indicating the relative expression of genes associated with the Adherens junction or Cell-cell junction assembly based on annotation in the REACTOME database. Results represent the mean of N = 4–5 biological replicates per treatment condition, with each replicate consisting of 5–6 pooled and identically treated HIOs. (B) Relative fluoresscence intensity over time in HIOs microinjected with 4 kDa FITC-dextran and imaged at 10 min intervals. HIOs were pretreated by microinjection with 104 CFU E. coli in PBS or PBS alone and cultured for 24 hr prior to treatment with media containing 10 μM SC-514 or PBS alone and the injection of 2 mg/ml FITC-dextran (4 kDa) at the start of imaging. Line represents the best fit to the mean fluorescent intensity values in each condition with the grey region indicating S.E. for the fit line. N = 7–9 HIOs per group. (C) Rate of bacterial translocation over time in HIOs treated as indicated in the figure legend as detected by daily collection of external HIO media and enrichment in bacterial growth broth. N = 24 (E. coli + SC-514), N = 48 (E. coli), and N = 12 (PBS and E. coli + vehicle). (D) Relative fluorescence intensity over time in HIOs microinjected with FITC-dextran and imaged at 10 min intervals. HIOs were pretreated by microinjection with 104 CFU E. coli in PBS or PBS alone and cultured for 24 hr prior to treatment with media containing 500 ng/ml TNF-α and 500 ng/ml IFN-γ or PBS alone and the injection of 2 mg/ml FITC-dextran (4 kDa) at the start of imaging. Line represents the best fit to the mean fluorescent intensity values in each condition with the grey region indicating S.E. for the fit line. N = 8–9 HIOs per group. (E) Representative confocal micrographs of HIOs treated as indicated in D. Fluorescent immunostaining pseudocoloring applied as indicated in the figure legend. 60X optical magnification with 2X digital zoom. SC-514, small molecule inhibitor of NF-κB ; HK, heat-inactivated; TNF, tumor necrosis factor-α; IFN, interferon-γ. Finally, we assayed epithelial barrier function under circumstances recapitulating physiologic inflammation. 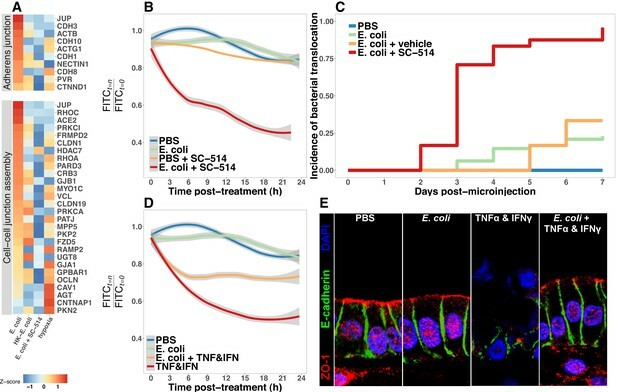 TNFα and IFNγ are key cytokines mediating innate and adaptive immune cell activity in the gut (Turner, 2009) during bacterial infection (Rhee et al., 2005; Emami et al., 2012) and in necrotizing enterocolitis (Tan et al., 1993; Ford et al., 1996, 1997; Halpern et al., 2003; Upperman et al., 2005). The combination of TNFα and IFNγ has been previously demonstrated to induce barrier permeability in a dose-dependent manner in Transwell epithelial cultures (Wang et al., 2005; Wang et al., 2006). Thus, HIOs were microinjected with PBS or live E. coli and cultured for 24 hr and were subsequently microinjected with FITC-dextran and treated with PBS or a cocktail of TNFα and IFNγ added to the external media to expose the basolateral epithelium (Figure 8D). Loss of FITC-dextran fluorescence was observed using live-imaging and indicated that treatment with TNFα and IFNγ alone resulted in a rapid and sustained decrease in luminal fluorescence relative to PBS or E. coli injected HIOs (p=5 × 10-4, Figure 8D). However, HIOs associated with E. coli prior to addition of the TNFα and IFNγ cocktail retained significantly more fluorescent signal relative to treatment with TNFα and IFNγ alone (p=0.042, Figure 8D). We examined expression and distribution of the tight junction protein ZO-1, and the basal-lateral protein E-cadherin (ECAD) in histological sections taken from PBS and E. coli-associated HIOs subjected to TNFα and IFNγ treatment (Figure 8E). Compared to controls, the epithelial layer is highly disorganized in HIOs treated with TNFα and IFNγ, with cytoplasmic ZO-1 staining and disorganized ECAD. By contrast, HIOs associated with E. coli prior to TNFα and IFNγ treatment retain and organized columnar epithelium with robust apical ZO-1 and properly localized ECAD staining (Figure 8E). Similarly, proper localization of additional markers of epithelial barrier integrity occludin (OCLN) and acetylated-tubulin are retained in HIOs associated with E. coli during TNFα and IFNγ treatment relative to HIOs treated with TNFα and IFNγ alone (Figure 8—figure supplement 1). These results suggest that colonization of the immature epithelium with E. coli results in an epithelium that is more robust to challenge by potentially damaging inflammatory cytokines. 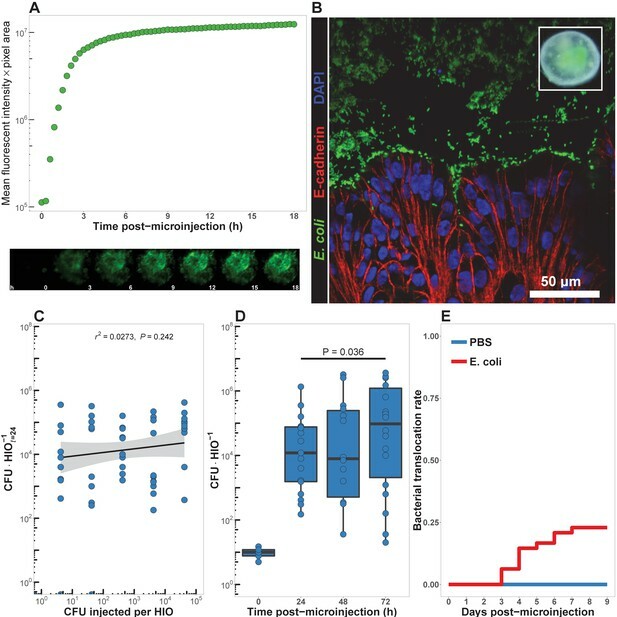 The work presented here demonstrates that HIOs represent a robust model system to study the initial interactions between the gastrointestinal epithelium and colonizing microbes that occurs in the immediate postnatal period. Microorganisms introduced into the digestive tract at birth establish an intimate and mutualistic relationship with the host over time (Costello et al., 2012; Palmer et al., 2007; Koenig et al., 2011; Bäckhed et al., 2015; Wopereis et al., 2014). However, the expansion of bacterial populations in the gut also presents a major challenge to intestinal homeostasis through the exposure to potentially inflammatory MAMPs (Tanner et al., 2015; Renz et al., 2011), consumption of tissue oxygen (Glover et al., 2016; Espey, 2013; Albenberg et al., 2014), digestion of the mucus barrier (Marcobal et al., 2013; Desai et al., 2016), and competition for metabolic substrates (Rivera-Chávez et al., 2016; Kaiko et al., 2016). The mature intestinal epithelium serves as a crucial barrier to microbes that inhabit the lumen and mucosal surfaces (Artis, 2008; Turner, 2009; Desai et al., 2016; Kelly et al., 2015; Cornick et al., 2015; Peterson and Artis, 2014; Hackam et al., 2013; Turner, 2009). The specific function of the epithelium in adapting to initial microbial colonization, independent of innate and adaptive immune systems, remains unclear due to the lack of appropriate model systems that recapitulate host-microbe mutualism. Clarifying the role of the epithelium in colonization of the digestive tract by microorganisms is essential to understanding the molecular basis of the stable host-microbe mutualism in the mature intestine. To examine the establishment of host-microbe mutualism, we chose to examine the interaction between the immature epithelium of HIOs and a non-pathogenic strain of E. coli. Enterobacteriaceae, including E. coli, are abundant in the newborn gut (Palmer et al., 2007; Koenig et al., 2011; Bäckhed et al., 2015; DIABIMMUNE Study Group et al., 2016). Several large-scale surveys of microbial composition have demonstrated that E. coli are among the most prevalent and abundant organisms in stool samples from newborns (Bäckhed et al., 2015; Koenig et al., 2011) and in meconium (Gosalbes et al., 2013). Non-pathogenic E. coli strains may represent ideal model organisms for examining the impact of bacterial colonization of the immature epithelium due to their prevalence in the neonatal population and relevance to natural colonization, extensive characterization, and ease of laboratory manipulation. Microinjection of non-pathogenic E. coli into the lumen of HIOs resulted in stable, long-term co-cultures (Figure 1). E. coli grows rapidly within the HIO lumen (Figure 1), reaching densities roughly comparable to populations found in the human small intestine (Donaldson et al., 2016) within 24 hr. Furthermore, the HIO is able to sustain this internal microbial population for several days while retaining the integrity of the epithelial barrier (Figure 1). Implicit is this observation is the conclusion that immature epithelium, along with a loosely structured mesenchymal layer, is intrinsically capable of adapting to the challenges imposed by colonization with non-pathogenic gut bacteria. To more closely examine these epithelial adaptations of microbial colonization, we performed transcriptional analysis of this response. HIOs colonized by E. coli exhibit widespread transcriptional activation of innate bacterial recognition pathways, including TLR signaling cascades and downstream mediators such as NF-κB (Figure 2). The cellular composition of the HIO epithelium is refined following E. coli colonization, with a rapid but transient increase in epithelial proliferation preceding a general reduction in the number of immature epithelial progenitor cells and the emergence of mature enterocytes expressing brush border digestive enzymes (Figure 3). Together, these results suggest that bacterial stimuli exert a broad influence on the molecular and cellular composition of the immature epithelium. Indirect stimuli resulting from microbial activity can also shape epithelial function (Buffie and Pamer, 2013), and the transcriptome of E. coli-colonized HIOs reflects a cellular response to reduced oxygen availability (Figure 2). Reduction of luminal O2 concentration occurs in the neonatal gut (Gruette et al., 1965; Fisher et al., 2013; Zheng et al., 2015), possibly as a result of the consumption of dissolved O2 by the anaerobic and facultative anaerobic bacteria that predominate in the intestinal microbiome in early life (Espey, 2013; Fanaro et al., 2003; Favier et al., 2002; Palmer et al., 2007), and the mature intestinal epithelium is hypoxic relative to the underlying lamina propria due to the close proximity to the anaerobic luminal contents (Glover et al., 2016; Kelly et al., 2015; Zheng et al., 2015). We measured luminal oxygen content and epithelial hypoxia in HIOs microinjected with live E. coli, finding that luminal oxygen concentration is reduced more than 10-fold relative to the surrounding media. This state of relative hypoxia extends into the epithelium itself and is correlated with increased microbial density (Figure 4). 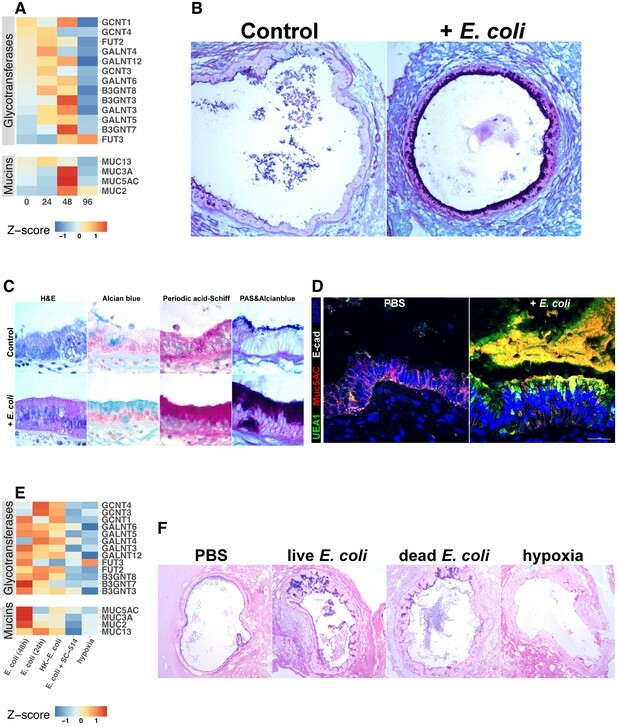 Thus, although HIOs lack the network of capillaries that play an essential role in tissue oxygen supply in the intestine, E. coli-colonized HIOs recapitulate in vitro the oxygen gradient present at the epithelial interface. Colonization of the HIO by E. coli therefore comprises two broad stimuli: immediate exposure to contact-mediated signals such as MAMPs, and the onset of limiting luminal oxygen and epithelial hypoxia. Although the potential significance of exposure to microbial products in the context of tissue hypoxia is widely recognized in the setting of necrotizing enterocolitis (Tanner et al., 2015; Afrazi et al., 2014; Hackam et al., 2013; Neu and Walker, 2011; Upperman et al., 2005; Nanthakumar et al., 2011), this two factor signaling paradigm has not been well studied as a component of normal intestinal colonization and development. Using the HIO model system, it was possible to design experiments which separately examine the relative impact of microbial contact-mediated signals from microbe-associated hypoxic signals (Figure 5 and Figure 5—figure supplement 2). This approach reveals that the full transcriptional response generated by the HIO following E. coli colonization is the product of both contact-dependent and hypoxia-dependent signals, with heat-inactivated E. coli or hypoxia alone recapitulating distinct subsets of the changes in gene expression observed in HIOs colonized with live E. coli (Figure 5). Future studies may examine the role of additional hypoxia-independent live microbe-associated stimuli, such as metabolic products (Kaiko et al., 2016) and viability-associated MAMPs (Sander et al., 2011), in mediating the epithelial response to initial bacterial colonization. NF-κB signaling has been implicated in the downstream response to both microbial contact-mediated signals (Zhang and Ghosh, 2001; Xiao and Ghosh, 2005; Kawai and Akira, 2007) and tissue hypoxia (Koong et al., 1994; Rius et al., 2008; Arias-Loste et al., 2015; Oliver et al., 2009; Zeitouni et al., 2016; Colgan et al., 2013; Grenz et al., 2012). Pharmacologic inhibition of NF-κB resulted in the suppression of both microbial contact- and hypoxia-associated gene expression in HIOs, inhibiting both contact-mediated epithelial barrier defense pathways and hypoxia-associated immune activation (Figure 5). NF-κB appears to play a key role in integrating the complex stimuli resulting from exposure to microbial products and the onset of localized hypoxia in the immature intestinal epithelium during bacterial colonization. The molecular and cellular maturation of the intestine that occurs during infancy ultimately results in enhanced functional capacity (Lebenthal and Lebenthal, 1999; Sanderson and Walker, 2000; Neu, 2007). Bacterial colonization is associated with enhanced epithelial barrier function in gnotobiotic animals, including changes in the production of antimicrobial peptides and mucus (Vaishnava et al., 2008; Cash et al., 2006; Goto et al., 2014; García-Lafuente et al., 2001; Malago, 2015; Ménard et al., 2008). Defensins produced in the intestinal epithelium are critical mediators of the density and composition of microbial populations in the gut and protect the epithelium from microbial invasion (Kisich et al., 2001; Ostaff et al., 2013; Cullen et al., 2015; Salzman et al., 2003; Salzman et al., 2010). Production of BD-2 is dramatically increased in HIOs immediately following E. coli colonization (Figure 2, Figure 5—figure supplement 2 and Figure 6), reaching concentrations that are sufficient to limit overgrowth of E. coli (Figure 6 and Figure 6—figure supplement 2) without completely precluding potentially beneficial bacterial colonization (Figure 1). Secreted and cell-surface associated mucins form a physical barrier to microbes in the gut, act as local reservoirs of antimicrobial peptide, and serve as substrates for the growth of beneficial microorganisms (Desai et al., 2016; Johansson and Hansson, 2016; Cornick et al., 2015; Hansson, 2012; Li et al., 2015; Dupont et al., 2014; Bergstrom and Xia, 2013). The immature HIO epithelium produces a robust mucus layer consisting of both neutral and acidic oligosaccharides with terminal carbohydrate modifications following colonization with E. coli (Figure 7). Importantly, hypoxia alone does not result in the production of mucus while the introduction of heat-inactivated E. coli induces mucus secretion at the apical epithelium (Figure 7), suggesting that microbial contact is the major stimulus eliciting mucus secretion in HIOs. Epithelial barrier permeability is an important parameter of intestinal function reflecting the degree of selectivity in the transfer of nutrients across the epithelial layer and the exclusion of bacteria and other potentially harmful materials (Bischoff et al., 2014). Increases in epithelial barrier permeability occur in the setting of inflammation (Ahmad et al., 2017; Michielan and D'Incà, 2015) and infectious disease (Shawki and McCole, 2017). Colonization of HIOs with E. coli results in increased transcription of genes associated with the formation of the adherens junction and other cell-cell interactions in the epithelium (Figure 8). However, inhibition of NF-κB signaling dramatically increases both epithelial barrier permeability and the rate of bacterial translocation (Figure 8), suggesting that NF-κB signaling is critical to maintaining epithelial barrier integrity following colonization. Expression of genes involved in the formation of the cell junction and the production of antimicrobial defensins and mucus are NF-κB dependent (Figures 6–8, Figure 7—figure supplement 1, Tsutsumi-Ishii and Nagaoka, 2002; Ahn et al., 2005). The inability to mount an effective innate defense response in the presence of NF-κB inhibition results in the failure of the HIO epithelial barrier and the loss of co-culture stability (Figure 8). This result underscores the critical role of NF-κB signaling in the formation of a stable host-microbe mutualism at the immature epithelial interface. Dysregulated production of pro-inflammatory cytokines contributes to the loss of epithelial barrier integrity in NEC (Tanner et al., 2015; Hackam et al., 2013; Neu and Walker, 2011; Nanthakumar et al., 2011; Halpern et al., 2003; Ford et al., 1997, 1996; Tan et al., 1993); this is recapitulated in HIOs, as exposure to pro-inflammatory cytokines results in the rapid loss of epithelial barrier integrity and the dissolution of epithelial tight junctions (Figure 8). Probiotics may promote epithelial barrier integrity in NEC (Robinson, 2014; Alfaleh et al., 2011; Underwood et al., 2014; Khailova et al., 2009) and HIOs colonized by E. coli exhibit enhanced epithelial barrier resilience (Figure 8). Functional maturation resulting from colonization of the immature intestinal epithelium may therefore play an essential role in promoting the resolution of physiologic inflammation. While great progress has been made in characterizing the composition of the gut microbiota in health and disease (Shreiner et al., 2015; Costello et al., 2012), this approach has a limited ability to discern the contributions of individual bacteria to the establishment of host-microbe symbiosis. Our work establishes an approach that recapitulates host-microbe mutualism in the immature human intestine in an experimentally tractable in vitro model system. Application of this approach may facilitate the development of mechanistic models of host-microbe interactions in human tissue in health and disease. For example, one of the major limitations in our understanding of NEC has been the lack of an appropriate model system to study colonization of the immature intestine (Neu and Walker, 2011; Balimane and Chong, 2005; Tanner et al., 2015; Nguyen et al., 2015). Our results suggest that colonization of the HIO with a non-pathogenic gut bacteria results in functional maturation of the epithelial barrier. Future work which examines the effects of organisms associated with the premature gut (Morrow et al., 2013; Greenwood et al., 2014; Ward et al., 2016) on the molecular, cellular, and functional maturation of the immature epithelium may be instrumental in elucidating mechanisms of microbiota-associated disease pathogenesis in the immature intestine. Human ES cell line H9 (NIH registry #0062, RRID:CVCL_9773) was obtained from the WiCell Research Institute. H9 cells were authenticated using Short Tandem Repeat (STR) DNA profiling (Matsuo et al., 1999) at the University of Michigan DNA Sequencing Core and exhibited an STR profile identical to the STR characteristics published by (Josephson et al., 2006). The H9 cell line was negative for Mycoplasma contamination. Stem cells were maintained on Matrigel (BD Biosciences, San Jose, CA) in mTeSR1 medium (STEMCELL Technologies, Vancouver, Canada). hESCs were passaged and differentiated into human intestinal organoid tissue as previously described (Spence et al., 2011; McCracken et al., 2011). HIOs were maintained in media containing EGF, Noggin, and R-spondin (ENR media, see [McCracken et al., 2011]) in 50 μl Matrigel (8 mg/ml) without antibiotics prior to microinjection experiments. For hypoxic culture experiments, HIOs were transferred to a hydrated and sealed Modular Incubator Chamber (MIC-101, Billups-Rothenburg, Inc. Del Mar CA) filled with 1% O2, 5% CO2, and balance N2 and maintained at 37 for 24 hr. Escherichia coli strain ECOR2 (ATCC 35321) was cultured in Luria broth (LB) media or 1.5% LB agar plates at 37 under atmospheric oxygen conditions. Glycerol stock solutions are available upon request. The assembled and annotated genome for the isolate of Escherichia coli strain ECOR2 used in these studies is available at https://www.patricbrc.org/view/Genome/562.18521. E. coli strain K-12 MG1655 (CGSC #6300) was obtained from the Coli Genetic Stock Center at Yale University (http://cgsc2.biology.yale.edu/) and was used only in the in vitro BD-2 activity experiments. Whole genome sequencing of E. coli strain ECOR2 was performed by the University of Michigan Host Microbiome Initiative Laboratory using the Illumina MiSeq platform. Microinjections were performed using a protocol modified from Leslie et al., 2015. Briefly, HIOs were injected using thin wall glass capillaries (TW100F-4, World Precision Instruments, Sarasota, FL) shaped using a P-30 micropipette puller (Sutter Instruments, Novato, CA). Pulled microcapilaries were mounted on a Xenoworks micropipette holder with analog tubing (BR-MH2 and BR-AT, Sutter Instruments) attached to a 10-ml glass syringe filled with sterile mineral oil (Fisher Scientific, Hampton, NH). Fine control of the micropippette was achieved using a micromanipulator (Narishge International Inc., East Meadow, NY) and microinjection was completed under 1-2X magnification on an SX61 stereo dissecting scope (Olympus, Tokyo, Japan). HIOs suspended in Matrigel (Corning Inc., Corning, NY) were injected with approximately 1 μl solution. A detailed and up-to-date HIO microinjection protocol is available at Hill, 2017b; a copy is archived at https://github.com/elifesciences-publications/HIO_microinjection). In bacterial microinjection experiments, the HIO culture media was removed immediately following microinjection and the cultures were rinsed with PBS and treated with ENR media containing penicillin and streptomycin to remove any bacteria introduced to the culture media during the microinjection process. After 1 hr at 37, the HIOs were washed again in PBS and the media was replaced with fresh antibiotic-free ENR. Luminal oxygen content was measured in HIOs using an optically coated implantable microsensor with a tip tapered at <50 μm (IMP-PSt1, PreSens Precision Sensing GmbH) attached to a micro fiber optic oxygen meter (Microx TX3, PreSens Precision Sensing GmbH, Regensburg, Germany). The oxygen probe was calibrated according to the manufacturer’s instructions and measurements of the external media and HIO luminal oxygen content were collected by mounting the microsensor on a micromanipulator (Narishge International Inc., East Meadow, NY) and guiding the sensor tip into position using 1-2X magnification on a stereo dissecting scope (Olympus, Tokyo, Japan). All oxygen concentration readings were analyzed using PreSens Oxygen Calculator software (TX3v531, PreSens Precision Sensing GmbH, Regensburg, Germany). For measurement of relative cytoplasmic hypoxia, HIO cultures were treated with 100 μM pimonidazol HCl (Hypoxyprobe, Inc., Burlington, MA) added to the external culture media and incubated at 37% and 5% CO2 for 2 hr prior to fixation in 4% parafomaldehyde. Pimonidazole conjugates were stained in tissue sections using the Hypoxyprobe-1 mouse IgG monoclonal antibody (Hypoxyprobe, Inc., Burlington, MA, RRID:AB_2335667) with appropriate secondary antibody (see antibody dilutions table). Immunostaining was carried out as previously described (Finkbeiner et al., 2015). Antibody information and dilutions can be found in Supplementary file 2. All images were taken on a Nikon A1 confocal microscope or an Olympus IX71 epifluorescent microscope. CarboFree blocking buffer (SP-5040; Vector Laboratories, Inc. Burlingame, CA) was substituted for dilute donkey serum in PBS in staining for mucins and carbohydrate moieties. EdU treatment and EdU fluorescent labeling using Click-iT chemistry was applied according to the manufacturer’s instructions (#C10339 Thermo Fisher, Waltham, MA). Supplementary file 2 contains a table of all primary and secondary antibodies, blocking conditions, and product ordering information. The NF-κB inhibitor SC-514 (Kishore et al., 2003; Litvak et al., 2009) (Tocris Cookson, Bristol, UK) was re-suspended in DMSO at a concentration of 25 mM. HIOs were treated with SC-514 suspended in DMSO added to the external ENR culture media at a final concentration of 1 μM. Efficacy of SC-514 was verified by Western blot of lysates from HIOs injected with PBS or live E. coli or injected with live E. coli in the presence of 1 μM SC-514 added to the external media. HIOs were collected after 24 hr in lysis buffer composed of 300 mM NaCl, 50 mM Tris base, 1 mM EDTA, 10% glycerol, 0.5% NP-40, and 1X Halt Phosphatase Inhibitor Cocktail (Pierce Biotechnology, Rockford, IL). Lysates were separated on a 10% Bis-Tris polyacrylamide gel under reducing conditions (Invitrogen, Carlsbad, CA) and transferred to PVDF using a wet transfer apparatus (Bio-Rad Laboratories, Hercules, CA) overnight at 4. The PVDF membrane was blocked in Odyssey TBS blocking buffer (LI-COR Biosciences, Lincoln, NE). The membrane was submerged in blocking buffer containing primary rabbit monoclonal antibodies against phosphorylated NF-κB p65 (1:200, Cell Signaling Technology #3033S) or total NF-κB p65 (1:400, Cell Signaling Technology #8242S) and incubated at room temperature for 2 hr. All washes were conducted in Tris-buffered saline with 1% Tween-20 (TBST). The secondary goat anti-rabbit IgG IRDye 800CW was diluted 1:15,000 in TBST and exposed to the washed membrane for 1 hr at room temperature. After additional washes, the PVDF membrane was imaged using an Odyssey Scanner (LI-COR Biosciences, Lincoln, NE). Incidence of bacterial translocation was determined in HIOs plated individually in single wells of 24-well plates and microinjected with E. coli. The external culture media was collected and replaced daily. The collected media was diluted 1:10 in LB broth in 96 well plates and cultured at 37 overnight. Optical density (600 nm) was measured in the 96-well LB broth cultures using a VersaMax microplate reader (Molecular Devices, LLC, Sunnyvale, CA). OD600> sterile LB broth baseline was considered a positive culture. For epithelial permeability assays, HIOs were microinjected with 4 kDa FITC-dextran suspended in PBS at a concentration of 2 mg/ml as described previously (Leslie et al., 2015) using the microinjection system detailed above. Images were collected at 10 min intervals at 4X magnification on an Olympus IX71 epifluorescent microscope using a Deltavision RT live cell imaging system with Applied Precision softWoRx imaging software (GE Healthcare Bio-Sciences, Marlborough, MA). Cultures were maintained at 37% and 5% CO2 throughout the imaging timecourse. For experiments involving cytokine treatment, recombinant TNF-α (#210-TA-010, R and D Systems) and INF-γ (#AF-300–02, Peprotech) were added to the external culture media at a concentration of 500 ng/ml at the start of the experiment. A detailed and up-to-date HIO microinjection and live imaging protocol is available at (Hill, 2017b). Recombinant human BD-2 (Abcam, Cambridge, MA) was reconstituted in sterile LB broth and diluted to 0.1–1 μg/ml. E. coli cultures were diluted 1:1000 in sterile LB containing 0–1 μg/ml BD-2 and transferred to a 96-well microplate. A VersaMax microplate reader (Molecular Devices, LLC, Sunnyvale, CA) was used to measure OD600 at 10 min intervals in microplates maintained at 37°C with regular shaking over a 18 hr timecourse. For stationary phase antimicrobial assays, overnight cultures of E. coli str. ECOR2 were diluted in PBS containing 1 μg/ml BD-2 or heat-inactivated BD-2 (heated at 120 for > 60 min) and placed in a 37 bacterial incubator for 5 hr. Cultures were then spread on LB agar plates and cultured overnight. The number of CFU was counted manually. Secreted cytokine, antimicrobial peptide, and growth factor concentrations were determined by ELISA (Duosets, R and D Systems, Minneapolis, MN) using the manufacturer’s recommended procedures at the Immunological Monitoring Core of the University of Michigan Cancer Center. RNA was isolated using the mirVana RNA isolation kit and following the 'Total RNA’ isolation protocol (Thermo-Fisher Scientific, Waltham MA). RNA library preparation and RNA-sequencing (single-end, 50 bp read length) were performed by the University of Michigan DNA Sequencing Core using the Illumina Hi-Seq 2500 platform. All sequences were deposited in the EMBL-EBI ArrayExpress database (RRID:SCR_004473) using Annotare 2.0 and are cataloged under the accession number E-MTAB-5801. Transcriptional quantitation analysis was conducted using 64-bit Debian Linux stable version 7.10 ('Wheezy’). Pseudoalignment of RNA-seq data was computed using kallisto v0.43.0 (Bray et al., 2016) and differential expression of pseudoaligned sequences was calculated using the R package DEseq2 (Love et al., 2014) (RRID:SCR_000154). Unless otherwise indicated in the figure legends, differences between experimental groups or conditions were evaluated using an unpaired Student’s t-test. A p-value <0.05 was considered to represent a statistically significant result. All statistical analyses were conducted using R version 3.4.1 (2017-06-30) (Core Team, 2017) and plots were generated using the R package ggplot2 (Wickham, 2009) with the ggstance expansion pack (Henry et al., 2016). The multiple testing-adjusted FDR was calculated using the DESeq2 implementation of the Wald test (Love et al., 2014). Gene pathway over-representation tests and Gene Set Enrichment Analysis (Subramanian et al., 2005) were implemented using the R packages clusterProfiler (Yu et al., 2012) and ReactomePA (Yu and He, 2016). Analyses conducted in R were collated using Emacs v25.2 (Stallman, 1981) with Org-mode v8.3.5 and the paper was written in LaTeX using Emacs. Complete analysis scripts are available on the Hill, 2017a GitHub repository (copy archived at https://github.com/elifesciences-publications/Hill_HIO_Colonization_2017). Clinical & Experimental Allergy 44:842–850. Laboratory Investigation; a Journal of Technical Methods and Pathology 12:355–364. Journal of Biological Chemistry 289:9584–9599. Cellular Physiology and Biochemistry 15:029–040. The Cochrane Database of Systematic Reviews 3:CD005496. European Journal of Biochemistry 253:743–750. The Journal of Cell Biology 178:635–648. Trends in Molecular Medicine 20:509–518. Cell Host & Microbe 17:852. Seminars in Cell & Developmental Biology 66:81–93. Journal of Surgical Research 172:18–28. American Journal of Physiology - Gastrointestinal and Liver Physiology 308:G510–G524. Cell Host & Microbe 18:445–455. Applied and Environmental Microbiology 68:219–226. Stem Cell Reports pp. 1140–1155. Cell Biochemistry and Biophysics 67:451–459. Seminars in pediatric surgery 5:155–159. Journal of Pediatric Surgery 32:275–282. Journal of Clinical Investigation 126:3680–3688. Clinical & Experimental Allergy 43:198–211. The Journal of Pediatrics 165:23–29. Current Opinion in Critical Care 18:178–185. Seminars in Pediatric Surgery 22:76–82. American Journal of Physiology - Gastrointestinal and Liver Physiology 284:G695–G702. Current Opinion in Microbiology 15:57–62. Note: R package version 0.3. Cellular and Molecular Gastroenterology and Hepatology 3:138–149. Trends in Molecular Medicine 13:460–469. AJP: Gastrointestinal and Liver Physiology 297:G940–G949. Journal of Biological Chemistry 278:32861–32871. Cell Host & Microbe 14:183–194. Journal of Parenteral and Enteral Nutrition 23:S3–S6. Cell Host & Microbe 19:550–559. The Journal of Experimental Medicine 205:183–193. Disease Models & Mechanisms 6:802–810. New England Journal of Medicine 364:255–264. Disease Models & Mechanisms 8:1–16. Arthritis Research & Therapy 11:215. The Journal of Immunology 175:1127–1136. Evidence-Based Child Health: A Cochrane Review Journal 9:672–674. AJP: Gastrointestinal and Liver Physiology 305:G348–G356. The American Journal of Gastroenterology 105:2687–2692. Cellular and Molecular Gastroenterology and Hepatology 3:41–50. Current Opinion in Gastroenterology 31:69–75. The American Journal of Pathology 142:1858–1865. The American journal of pathology 185:4–16. Journal of Leukocyte Biology 71:154–162. Seminars in Pediatric Surgery 14:159–166. Cold Spring Harbor, New York: Cold Spring Harbor Laboratory Press. European Journal of Pediatrics 155:627–632. The Journal of Immunology 173:5398–5405. The American Journal of Pathology 166:409–419. Pediatric Allergy and Immunology 25:428–438. Advances in Experimental Medicine and Biology 560:41–45. Molecular and Cellular Biology 34:3013–3023. Molecular and Cellular Pediatrics 3:14. Journal of Clinical Investigation 107:13–19. American Journal of Physiology - Cell Physiology 309:C350–C360. Thank you for submitting your article "Bacterial colonization stimulates a complex physiological response in the immature human intestinal epithelium" for consideration by eLife. Your article has been reviewed by three peer reviewers, and the evaluation has been overseen by a Reviewing Editor and Wendy Garrett as the Senior Editor. One of the reviewers, Emma Slack, has agreed to share her identity. The reviewers have discussed the reviews with one another and the Reviewing Editor has drafted this decision to help you prepare a revised submission. There was consensus among the reviewers that your manuscript would be most appropriate, if adequately revised, for our Tools and Resources section. Human intestinal organoids (HIOs) were used to investigate host microbial interactions at the epithelial surface. Using live or dead Escherichia coli they report contact and hypoxia driven responses with antimicrobial peptide production, maturation of the mucus layer and improved paracellular barrier function. The paper represents a technical development of the HIO system, with findings that are aligned with interpretations from previous culture systems. Especially for a paper where the main point is development of an experimental system, the technical validation and reporting of the methods and results in the paper must be completely solid. The reviewers noted missing information on the number of biological and technical repeats, concentrations of stimuli, number of injected bacteria from the figure legends. The Materials and methods section was considered incomplete to allow a researcher from a related field to exactly reproduce every experiment shown – concentrations, solvents and timings – e.g. Figure 7, how much TNF, how much IFNgamma? It was unclear exactly how the false discovery rate was assessed – which algorithm was used? What sample numbers were used in the calculations and how reproducible were the experiments? Specific information about the E. coli strain should be given, and whether it is motile. The model depends on selective injection of live bacteria into HIOs and evidence is provided in Figure 1 about this. The experimental protocol needs to be far more explicit in the main body of the text: in the Materials and methods under 'HIO culture' it is stated 'HIOs were maintained in ENR media without antibiotics prior to microinjection experiments'; then under 'Microinjection', '…cultures were rinsed with PBS and treated with ENR media containing penicillin and streptomycin…'. Controls that assess the potential influence of carry-over of antibiotics of the readouts reported in Figure 1 are required. A) Figure 1B appears to be compromised by fixation and/or freezing artifacts. B) In Figure 1C the y axis is labelled 24h δ CFU. Given that the scale becomes fractional, it seems likely that ratios rather than differences are being used. C) What dose(s) of injections were used for 1D? D) As a main panel of Figure 1E, showing two agar plates does not add much, especially when the legend does not give details of exactly when are how they were generated. Further, the final sentence of the third paragraph in subsection “HIOs can be stably associated with commensal E. coli” and the results quoted in the following paragraph after day 3 are contradictory. Controls are absolutely necessary to ensure that these findings are not simply due to antibiotic carry-over. The transcriptomic approach does not capture all basic information about the system. Does the E. coli injection alter the size, morphology and longevity of the HIOs? Does it alter the rate of epithelial cell turnover (which could be easily tested by BrdU labeling, and would be predicted from e.g. Proc Natl Acad Sci U S A. 2011 Mar 15;108 Suppl 1:4570-7)? Does it alter the pattern of epithelial cell maturation, i.e. the fraction of mature paneth cells, goblet cells, enteroendocrine cells etc? Using the pathway analysis from the GO and REACTOME databases limits the insight that the reader is given into the changes in gene expression. For example, in Figure 2C 'muscle cell differentiation' is shown as a pathway. It would be possible to report detailed network analyses at least in the supporting material so that the contribution of different transcripts to the overall analysis is clear. This would allow considerable refinement of the time-dependent transcriptional response descriptions in the text. In Figure 3C it is difficult to appreciate whether the cadherin stain has worked in the PBS panel. How reproducible are these results? What happens with a hypoxic control? The data analysis shown in Figure 4 was complex and challenging for the reviewers to appreciate in its current form. The subset organisation must be clear and specific. A) Why is there no PBS control with the NFkB inhibitor? Many cell survival/cell death pathways converge on NFkB signalling and the inhibitor may exert effects already at baseline which would then fall into gene set 1 and gene set 2? From the Venn-diagrams shown in panel A, it appears that genes in set 1 and 2 are mutually exclusive, which would make the lacking control less problematic, but apparently the hypoxia-responsive genes are highly enriched in both (of course these may be different genes in the same pathway? But this would be slightly surprising if a statistical exclusion had been made). B) For the discussion of the analysis, it appears that an assumption is made that the effect of live E. coli is identical to dead E. coli combined with hypoxia. There is a large body of literature on "vital PAMPs" (e.g. Nature. 2011 May 22;474(7351):385-9), which might suggest there is more to it. Nevertheless, there appears to be an excellent correlation between genes regulated by live and dead E. coli in the plots in Figure 4B. If the hypothesis is correct, then injecting dead E. coli and then immediately transferring the organoids to a hypoxic chamber should produce a gene-expression profile that correlates better that the dead E. coli alone. Noticeably the gradient of the correlation between hypoxia/PBS and live E. coli/PBS seems to be close to zero? C) Is there some sort of statistical significance cut-off for the genes identified for each set in panel B? The clouds appear to very closely approach a log2-FC of zero, suggesting genes showing very small changes in expression are included? Would it be logical to show the data pre-filtered for p-value? Or show the limits of the region and color-code for p-value? D) In panel C, is it right that "% genes matched to pathway" is this the percentage of genes from each set (e.g. the full 1940 genes in Set 1) that map to the indicated pathway? Thus 5%, i.e. around 400 genes from set 1 map to "regulation of cytoskeleton organization"? Please clarify. Also, as the plots in B suggest that many genes are included with a very small up- or down-regulation, it would be important to have some handle on not just the significance, but also the average absolute size of the change observed. A second set of graphs, or a supplementary figure with more information would be helpful. E) In the legend, were pathways with enrichment P-values greater than 0.01 excluded? In Figure 5B and C, it would be important to include a group microinjected with dead E. coli, immediately followed by hypoxia, to conclude that both factors act together to induce b-defensins. For Figure 5D, does hBD-2 require a reducing agent for activity as hBD1 does (Nature 469, 419-423)? Typically, these pore-forming AMPs to exert a stronger effect on the rapidly growing bacteria than in the stationary phase, and in fact, your maximum growth rate (i.e. maximum curve gradient) is even higher where the BD-2 is added, suggesting that something in the BD-2 may even permit faster E. coli growth in LB. Death over several hours in late stationary phase may be rather due to accumulation of a toxic metabolite. To control for these effects, it will be important to show growth data with heat-inactivation of the BD-2. To focus on killing in the stationary phase a late stationary-phase culture could be treated with differing concentrations of BD-2 over short time-courses (including the inactivated controls), measuring loss of membrane integrity by Sytox-green uptake by flow cytometry or microscopy. As O-antigens can inhibit AMP function, E. coli K-12 could be included in these experiments. In relation to Figure 6, can induction of mucus production and induction of goblet cell differentiation be delineated? The slow appearance of mucin gene upregulation appears more consistent with a differentiation phenotype than simple gene expression? The interpretation that 'Epithelial barrier integrity is enhanced following bacterial association' (p13) is rather at odds with the data in Figure 7 B and D where the PBS and E. coli treated permeability is the same. Is the meaning that NFkappaB signaling is required for the compensatory effects of the barrier in E. coli-treated organoids? What is the effect of the inhibitor alone? Especially for a paper where the main point is development of an experimental system, the technical validation and reporting of the methods and results in the paper must be completely solid. The reviewers noted missing information on the number of biological and technical repeats, concentrations of stimuli, number of injected bacteria from the figure legends. The Materials and methods section was considered incomplete to allow a researcher from a related field to exactly reproduce every experiment shown – concentrations, solvents and timings – e.g. Figure 7, how much TNF, how much IFNgamma? Thank you for highlighting our oversight to include more details on the experimental methods and design. All figure legends have been revised to include the number of replicates and relevant details regarding the experimental setup. Given that microinjecting HIOs is not trivial, we had decided to write a methods paper dedicated to describing this technique in painful detail. Thus, we recently submitted a revised version of a manuscript describing the methodology for microinjecting and measuring FITC-dextran permeability in HIOs, which was accepted at the Journal of Visualized Experiments today (see attached letter of acceptance). We have deposited a pre-print version of this manuscript, which is available at https://github.com/hilldr/HIO_microinjection. We have referenced to this website in the Materials and methods with the hopes that interested readers will have access to all of the details necessary to repeat our procedures. Finally, recognizing the Editor's decision to consider this manuscript for the Tools and Resources section, we have devised a schematic illustrating our experimental setup for the HIO colonization experiments (Figure 1—figure supplement 3). We hope that this will help the reader conceptualize the experimental scheme, evaluate the experiments presented, and devise new experiments to follow up on this work. It was unclear exactly how the false discovery rate was assessed – which algorithm was used? What sample numbers were used in the calculations and how reproducible were the experiments? https://github.com/hilldr/Hill_HIO_Colonization_2017, and we have also noted access to this information in the Materials and methods section. Specific information about the E. coli strain should be given, and whether it is motile. Regarding the E. coli strain ECOR2 that was used for these studies, we have performed whole geneome sequencing, annotation, and assembly. Details are given in the Materials and methods and this data is available using the PATRIC online bacterial genomics platform. Phylogenetic analysis of the complete genome (Figure 1—figure supplement 2) indicates that ECOR2 is closely related to the well-studied E. coli type strain K-12 MG1655 and other nonpathogenic E. coli isolates. E. coli strain ECOR2 is available from ATCC. We have also indicated in the manuscript that we are willing to share isolates of this organism with interested researchers pending appropriate permissions of ATCC, who owns the strain. In the interest of brevity, we originally aimed to write a concise description of the methodology. However, clarity is more important than conciseness in this case, particularly given the Editor's proposal to publish this work under the Tools and Resources section. We have made a concerted effort to improve the level of detail in our reported HIO culture methods. Notably, we have added a supplement to Figure 1 (Figure 1—figure supplement 3) containing a schematic representation of our bacterial microinjection and co-culture scheme and data supporting our methodology. As illustrated in Figure 1—figure supplement 3B, by comparing LB vs PBS as a vehicle for microinjection, we determined that the solution used to dilute E. coli cultures for microinjections could have a marked effect on the growth of E. coli within the HIO. Thus, all E. coli microinjections were performed using E. coli diluted in PB. Furthermore, we show that while maintaining antibiotics in HIO cultures for the duration of a co-culture experiment does not prevent E. coli growth in the HIO lumen, the average E. coli density was significantly reduced in HIO cultures in the presence of antibiotics (Figure 1—figure supplement 3C). As a result, we decided to perform only a brief 1 h antibiotic incubation immediately following microinjection to limit potential growth in the media outside of the HIO. However, this raised concerns that antibiotic carryover could potentially account for the apparent low rate bacterial translocation in HIOs microinjected with E. coli. To address this concern, we tested the bacterial growth inhibition potential of culture media collected from HIOs during the 1 h antibiotic incubation that follows microinjection relative to HIO media samples collected after a PBS wash and replacement with fresh, antibiotic-free media. ENR media containing antibiotics precluded growth of E. coli str ECOR2, while antibiotic-free media collected after the culture washout had no inhibitory effect on E. coli growth (Figure 1—figure supplement 3D). Furthermore, antibiotic-free HIO media was changed daily for the experiments presented in Figure 1E and 8C, meaning that any carryover antibiotic activity (undetectable in the experiments presented in Figure 1—figure supplement 3D) would be reduced many fold within a day or two. By performing these additional experiments to validate our experimental workflow, we are now more confident that our results reflect the influence of the bacterial interaction with HIO, and are not influenced by antibiotic carryover. This was a good observation, as the data presented was taken from a frozen section. We have replaced this figure with a high magnification confocal micrograph of an HIO at 24 hours after microinjection with live E. coli from a separate experiment, and from a sample that was processed through paraffin embedding and sectioning. We hope the use of this alternative data will allow the reader to see the physical relationship between the HIO and E. coli with greater clarity. The reviewers are correct in pointing out that the y-axis label in Figure 1C was inaccurate. This has been amended in the revised manuscript. In addition, Figure 1—figure supplement 2 has been provided to clarify the exact relationship between the input CFU at t=0 and the CFU harvested from the lumen at 24 hours post microinjection. For Figure 1D, the HIOs were microinjected with 10 CFU E. coli each. The figure legend has been amended to fix this. Figure 1E has been removed from the main figure. Our intended purpose was to illustrate the growth of E. coli within the HIO lumen and the absence of growth in the external media, findings that are made clear in Figures 1D and 1F (now 1E). While the transcriptional analysis demonstrated a time-dependent change in the molecular content of the cells that comprise the HIO following E. coli colonization, bacteria could alter the cellular composition of the HIO tissue as well. As mentioned by the reviewers, previous studies have demonstrated that bacterial colonization promotes epithelial proliferation in model organisms. We conducted an experiment to examine epithelial proliferation and differentiation in HIOs over a timecourse of 96 hours, resulting in a new figure being added to the main text (Figure 3). The number of proliferating epithelial cells was elevated by as much as 3-fold in E. coli-colonized HIOs relative to PBS-treated HIOs at 24 h. However, at 48 h post-microinjection, the proportion of proliferating epithelial cells was significantly decreased in E. coli colonized HIOs relative to control treated HIOs. This observation was supported by RNA-seq data demonstrating an overall suppression of cell cycle genes in E. coli colonized HIOs relative to PBS-injected HIOs at 48 h post-microinjection (Figure 3—figure supplement 1). By 96 h post-microinjection the proportion of EdU+ epithelial cells was nearly identical in E. coli and PBS-treated HIOs (Figure 3B). These results suggest that E. coli colonization is associated with a rapid burst of epithelial proliferation, but that relatively few of the resulting daughter cells are retained subsequently within the epithelium. We also examined Sox9 expression in HIOs following microinjection with E. coli or PBS alone. Sox9 is known to mark the progenitor domain in the immature intestine, and its expression was dramatically reduced in E. coli-colonized HIOs at 48-96 h after microinjection and was notably distributed in distinct clusters directly adjacent to the underlying mesenchyme. This observation indicates an overall reduction in the number of progenitor cells in the HIO epithelium following E. coli colonization and implies that other epithelial types may account for a greater proportion of the HIO epithelium at later time points postcolonization. Although we saw no difference in the proportion of epithelial cells expressing goblet, Paneth, or enteroendocrine cell markers (MUC2, DEFA5, and CHGA, respectively), expression of the enterocyte brush border enzyme dipeptidyl peptidase-4 (DPPIV) was found only in the E. coli-colonized HIOs at 48 and 96 h post-microinjection. We interpret these data to mean that /E. coli/ colonization induces a transient increase in the rate of epithelial proliferation followed by a subsequent reduction in proliferation, progenitor cells and an increase in the enterocyte-like population. It is accepted that enteroids are 3 dimensional structures, and the study has been productive in the evaluation of stem cell dynamics and other tissue level events. However, organoids are not vascularized with a capillary network that generate O2 gradients in vivo, thus organism level physiological events such as hypoxia are difficult to address and these caveats must be included in the discussion. In the intestine oxygen is supplied to the epithelium via a network of capillaries that extend into the lamina propria underlying the epithelium. Recent work has demonstrated that healthy intestinal epithelium exists in a state of relative hypoxia in comparison to the underlying mucosae due to the impact of the anaerobic luminal environment (Glover, Lee and Colgan, 2016, Kelly et al., 2015, Schmidt and Kao, 2014), although the molecular mecahnisms that allow the epithelium to fluorish under these conditions remain unclear. Stem cell derived human intestinal organoids (or enteroids) lack endothelial tissue and oxygen is apparently supplied to the tissue via diffusion through the media, similar to traditional cell culture systems. However, our work suggests that HIOs may be an excellent model system for studying the hypoxia gradient that exists between the lumen and the intestinal epithelium and underlying lamina propria and the changes in the relative state of oxygenation that occur during bacterial colonization (Figure 4) and under other conditions such as inflammation. We have added comments to the discussion clarifying the distinction between localized epithelial hypoxia and tissue hypoxia that occurs as a result of changes in blood flow, which cannot be modeled in the HIO at present. With the GSEA analysis presented in Figure 2, we aimed to present a broad scale overview of the coordinated, time-dependent transcriptional response to E. coli colonization based on GO and REACTOME databases. Gene-level pathway analysis may compliment this approach by illustrating the interactions between genes and suggesting mechanistic relationships. Based on the reviewer's suggestion, we have performed a variety of gene level analysis of previously annotated KEGG pathways using the Pathview software package (R/Bioconductor). This resulted in a pathway diagram demonstrating broad reduction in the expression of cell cycle genes at 48 h post-microinjection in E. coli colonized HIOs, consistent with our findings in Figure 3, and has been included as Figure 3—figure supplement 1 in the revised manuscript. We thank the reviewers for this valuable suggestion. The KEGG, GO and REACTOME databases are valuable resources for understanding the relationships between genes and interpreting large scale transcriptional changes. However, these tools are inherently limited to known pathways and may fail to identify novel interactions between networks of genes. We performed a gene regulatory network inference analysis of our E. coli colonization timecourse data using the method described by Simoes and EmmertStreib (PLOS 2012). This analysis identified a large network of genes that are dynamically expressed over 24-96 h post-microinjection that was highly enriched for tissue development, metabolism, carbohydrate transport, and glycotransferases. A preliminary figure illustrating this network is provided below. We feel that this analysis is valuable; however, in order to glean meaningful insights from the data we will need to spend significant additional time interrogating it using these methods. We feel that in its current from it is preliminary and may not add meaningful information to our manuscript. Interested readers will find that the genes included in each of the pathways shown in Figure 2C are listed in the supplemental data table and in the analysis materials at https://github.com/hilldr/Hill_HIO_Colonization_2017. We have repeated the experiment in a new cohort of HIOs and included new representative immunostaining for all conditions, including heat-inactivated E. coli and hypoxic culture controls (Figure 4C). In addition, we tabulated the number of PMDZ+ HIOs in each condition from two combined experiments and have included this data as a sub-panel of Figure 4C. In our hands, the PMDZ staining is quite reliable and demonstrates an apparent decrease in epithelial oxygen content in HIOs injected with live E. coli or HIOs subjected to 1% O2 for 24 hours relative to HIOs injected with heat-inactivated E. coli or PBS. We are pleased with the results of the control staining and appreciate the reviewers for bringing this oversight to our attention. A) Why is there no PBS control with the NFkB inhibitor? Many cell survival/cell death pathways converge on NFkB signalling and the inhibitor may exert effects already at baseline which would then fall into gene set 1 and gene set 2? We included control HIOs injected with PBS and treated with SC-514 in our initial experiment and uploaded the relevant RNA-seq data to the public repository at EMBL (E-MTAB-5801), however we did not address this dimension of the experiment in our original manuscript out of concerns that it might over-complicate the presentation of our analysis. However, in response to concerns from the reviewers, we have added supplemental figures, which we hope will clarify the baseline effects of the NF-κB inhibitor SC-514. Figure 5—figure supplement 1C shows the log2-transformed fold-change in gene expression relative to PBS-injected controls for all 7 experimental conditions examined in this set of experiments: live E. coli +/- SC-514, heatkilled E. coli +/- SC-514, and hypoxic culture +/- SC-514, and PBS + SC-514. This figure shows that the number of genes altered by treatment with SC-514 alone is comparable to the set of genes altered in other experimental conditions, although there are generally more genes that are down-regulated by SC-514 exposure than there are genes that are upregulated by SC-514. We examined over-represented genes sets from the GO, KEGG, and REACTOME databases in genes that were significantly up- or down-regulated by treatment with SC-514 alone (Figure 5—figure supplement 1D) in order to better understand the types of processes that might be influenced by SC-514 exposure. We plotted the pathways that were in the top 90 percentile based on statistical significance, indicating a high degree of enrichment in the gene subsets regulated by NF-κB inhibitor SC-514 at baseline. The data indicates that SC-514 may suppress some aspects of transcription and translation and may up-regulate authophagy and translation-associated processes. Notably, SC-514 does not appear to have a strong effect at baseline on the pathways identified in Figure 5 as key NFkB-dependent responses to bacterial contact and/or hypoxia, namely innate and adaptive defense, epithelial barrier integrity, angiogenesis and hypoxia signaling, or intestinal development. From the Venn-diagrams shown in panel A, it appears that genes in set 1 and 2 are mutually exclusive, which would make the lacking control less problematic, but apparently the hypoxia-responsive genes are highly enriched in both (of course these may be different genes in the same pathway? But this would be slightly surprising if a statistical exclusion had been made). This is an important oversight on our part, as the original version of Figure 5A implied that there were no overlapping genes between Gene Set I and Gene Set II. This was not our intention, as it is perfectly feasible that some genes may be induced by either bacterial contact OR hypoxia via NF-κB. In Figure 5—figure supplement 1E, we plotted a Venn diagram showing the degree of overlap between Gene Set I, Gene Set II, and the set of genes that are significantly down-regulated in PBS-injected HIOs treated with SC-514. In fact, the Venn diagram shown as Figure 5—figure supplement 1E demonstrates that there are 603 genes that are indeed induced by either hypoxia OR bacterial-contact in an NF-κB dependent manner. This analysis demonstrates that the majority of contact- or hypoxia-induced genes that are NF-κB dependent are not significantly down-regulated in PBS-injected HIOs treated with SC-514 only. However, some genes suppressed by SC-514 at baseline may be biologically significant. Therefore, we examined over-represented genes sets from the GO, KEGG, and REACTOME databases in genes that were shared between Gene Set I or II and the set of genes that are significantly down-regulated in PBS-injected HIOs treated with SC-514 (Figure 5—figure supplement 1F). This analysis indicates that the biggest effects of SC-514 at baseline among Gene Set I and Gene Set II genes are related to metabolism, redox state, and transcription/translation. SC-514 may also have an effect of suppressing the response to hypoxia at baseline, which is not surprising given the relatively low oxygen conditions of HIO culture even prior to treatment (Figure 4). Thus, while SC-514 does have some potentially interesting effects on transcription in the HIO even at baseline, the effect of SC-514 alone cannot account for the major NF-κB dependent responses induced by contact and/or hypoxia. We appreciate that the reviewers brought this important point to our attention and we feel that this additional analysis strengthens our conclusion in Figure 5 that NF-κB-dependent responses to bacterial contact and/or hypoxia include innate and adaptive defense, epithelial barrier integrity, angiogenesis and hypoxia signaling, or intestinal development. The reviewers have clarified an underlying implication of our analysis of microbial contact and hypoxia presented in Figure 5: contact with microbial products under hypoxic conditions may recapitulate the effects of colonization with metabolically active live bacteria. Although this condition was not included in our original RNA-seq analysis and the limited time alotted for revision prevents us from completing a follow-up transcriptional analysis, we have examined this hypothesis by evaluating the role of microbial contact and microbe-associated hypoxia in colonization-induced changes in AMP, cytokine, and growth factor secretion (Figure 5—figure supplement 2). The results indicate a complex interplay between hypoxia and bacterial contact stimuli that shapes protein expression during bacterial colonization, with some factors induced by either microbial contact or hypoxia alone (IL-6), other cases in which either bacterial contact or hypoxia appears to be the dominant stimuli (BD-2), and a third regulatory paradigm in which the response to live E. coli evidently results from the cumulative influence of bacterial contact and hypoxia (BD-1, IL-8, VEGF). Taken together with our transcriptional analysis, this analysis demonstrates that association of immature intestinal epithelium with live E. coli results in a complex interplay between microbial contact and microbe-associated hypoxia induced gene expression and protein secretion. We apologize that this was not made more clear in the initial submission. We did use p-value as a pre-filter for this analysis and we also used only genes that were up-regulated in a treatment group, relative to control. We have revised the text to ensure that this information on how we filtered the data is made more explicit. Since we used p-values as a filter, some genes that had very modest fold change differences were included in the analysis, explaining the log2-FC values that approach zero. We hope that the clarification around this text makes the data presented sufficiently clear. D) In panel C, is it right that "% genes matched to pathway" is this the percentage of genes from each set (e.g. the full 1940 genes in Set 1) that map to the indicated pathway? Thus 5%, i.e. around 400 genes from set 1 map to "regulation of cytoskeleton organization"? Please clarify. Yes, that is the correct interpretation of the x-axis label. We have revised the label to read "% genes from input set matched to pathway", which we hope will improve clarity for the reader. The plotted value is the proportion of input genes (i.e. the 1,940 genes in Gene Set I) that are included in the given GO or REACTOME pathway set. Therefore if ~4% of genes in Gene Set I map to "regulation of cytoskeleton organization" this would be the equivalent of 0.04 x 1,940 = 97 genes. Note that many genes are assigned to multiple GO and REACTOME terms, and while have tried to avoid redundancy in our choice of pathways in the plot, several of these terms will contain overlapping genes. The complete dataset table of results is available on the GitHub repository (https://github.com/hilldr/Hill_HIO_Colonization_2017). Also, as the plots in B suggest that many genes are included with a very small up- or down-regulation, it would be important to have some handle on not just the significance, but also the average absolute size of the change observed. A second set of graphs, or a supplementary figure with more information would be helpful. To address this concern, we have generated a plot of the log2-transformed fold-change in gene expression relative to PBS-injected controls for all 7 experimental conditions examined in this set of experiments: live E. coli +/- SC-514, heat-killed E. coli +/- SC-514, and hypoxic culture +/- SC-514, and PBS + SC-514 (Figure 5—figure supplement 1C). The format of the plot is identical to the plot shown in Figure 2A, and shows the fold-change in expression of all transcripts measured in a given condition relative to PBS treatment alone (grey) with significantly up- and down-regulated transcripts colored in red and blue, respectively. This figure reveals that the scale of the global transcriptional response varies somewhat between experimental conditions. This may be expected, given, for example, that hypoxic culture would be expected to permeate both epithelial and mesenchymal cells throughout the HIO, whereas the impact of heat-inactivated E. coli injected into the HIO lumen may be more limited. This was a typographical error. Pathways with P-values > 0.01 were excluded from the plot and the legend has been amended to fix this. Following the reviewers’ suggestion, we have performed in vitro E. coli experiments utilizing heat-inactivated BD-2 as a control (Figure 5—figure supplement 2). We found that heat inactivation of the recombinant BD-2 peptide completely abrogated the reduction in E. coli growth caused by addition of BD-2 to the cultures. Furthermore, we confirmed that this recombinant BD-2 has similar inhibitory activity against E. coli K-12, suggesting that the effects of BD-2 are not strain specific. We have also included data on the effect of BD-2 on bacterial carrying capacity derived from the growth curves (Figure 5D and Figure 5—figure supplement 2). Our original hypothesis was that up-regulation of AMP expression in HIOs following E. coli microinjection (Figures 2E, 5A-C) may contribute to limited E. coli growth in the HIO lumen (Figure 1C-D). BD-2 significantly reduces carrying capacity in vitro at concentrations consistent with conditions in the HIO (Figure 5D and Figure 5—figure supplement 2B). This demonstrates that an AMP expressed by HIOs in response to E. coli colonization has the potential to reduce microbial growth in the HIO. As pointed out by the reviewer, questions remain as to the mechanism of action of human β defensins. Multiple mechanisms of action have been proposed in the literature (Ulm et al. Front. Immunol. 2012, Brogden, 2005) including pore formation, transcriptional and metabolic inhibition, inhibition of membrane transporters, etc., which vary between defensin family members and specific bacterial targets and can be influenced by the local biochemical conditions such as redox state (Nature 469, 419-423). While we agree that this presents an interesting question, we have not defined the specific mechanism(s) of action for BD-2 against E. coli str. ECOR2. Such mechanistic studies involve complex structural biology and bacterial genetics experiments and lie outside of our expertise, the time limitations on this revision, and are somewhat outside the intended scope of this manuscript. This is a question that we have asked ourselves from an early point in this project. To date, we have found no evidence that the increase in mucus production is associated with an increase in the number of goblet cells. As mentioned above, we saw no difference in the proportion of epithelial cells expressing goblet, Paneth, or enteroendocrine cell markers (MUC2, DEFA5, and CHGA, respectively). Based on staining and RNA-seq transcript counts, Mucin 5AC appears to be more abundant than Mucin 2 in E. coli colonized HIOs (Figure 7 and Figure 7—figure supplement 1). This may be significant, as Mucin 5AC is not specific to the goblet cell but is widely expressed by the small intestinal enterocytes. The increase in Mucin expression correlates with the emergence of DPPIV+ epithelial cells, suggesting that the mature enterocyte population contributes to the increase in mucus production. The reviewers are correct to note that E. coli colonization itself does not result in a decrease in barrier permeability compared to PBS, and that the presence of NF-κB inhibitor results in increased barrier permeability. This implies that NF-κB is required for the mediating the response to E. coli colonization. 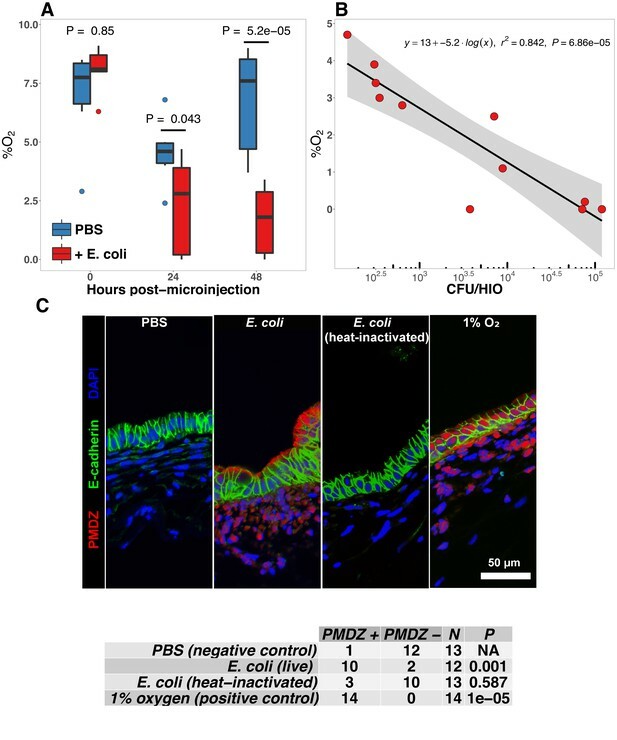 Our original intention was to highlight two findings: 1) that maintenance of epithelial barrier integrity following E. coli colonization is NF-κB dependent, and 2) that bacterial colonization mitigates damage to the epithelial barrier and increases in epithelial barrier permeability following exposure to pro-inflammatory cytokines. We originally highlighted these two findings under a single header, stating that both were evidence of enhanced barrier integrity. The reviewer's comments, however, make it clear that these data are probably best presented as two distinct findings, and that is the approach we took in the Discussion. We have therefore separated our description of these results into two distinct headers in the Results section. We hope that this will clarify and highlight the effects of bacterial colonization on HIO barrier function and improve consistency with the interpretation we have laid out in the Discussion. We have also added an additional treatment group to Figure 8B. HIOs were microinjected with PBS alone 24 h prior to microinjection with FITC-dextran and the addition of HIO media containing SC-514 ('PBS + SC-514'). Treatment with SC-514 alone had no detrimental effect on barrier function. We interpret this data as demonstrating that inhibition of the NF-κB pathway prevents the epithelial response to bacterial stimuli (both bacterial contact and hypoxia) that normally bolsters barrier function. The result is increased epithelial barrier permeability (Figure 8B) and a higher incidence of bacterial translocation (Figure 8C). The authors would like to thank Joel Whitfield of the Immunological Monitoring Core of the University of Michigan Cancer Center, Robert Lyons and Tricia Tamsen of the University of Michigan DNA Sequencing Core, Chris Edwards of the University of Michigan Molecular Imaging Laboratory, and April Cockburn and Micah Kiedan of the University of Michigan Host Microbiome Initiative Laboratory for providing invaluable technical assistance. JRS is supported by the Intestinal Stem Cell Consortium (U01DK103141), a collaborative research project funded by the National Institute of Diabetes and Digestive and Kidney Diseases (NIDDK) and the National Institute of Allergy and Infectious Diseases (NIAID). JRS and VBY are supported by the NIAID Novel Alternative Model Systems for Enteric Diseases (NAMSED) consortium (U19AI116482). DRH is supported the Mechanisms of Microbial Pathogenesis training grant from the National Institute of Allergy and Infectious Disease (NIAID, T32AI007528) and the National Center for Advancing Translational Sciences (UL1TR000433). Human subjects: Normal, de-identified human fetal intestinal tissue was obtained from the University of Washington Laboratory of Developmental Biology. Normal, de-identified human adult intestinal issue was obtained from deceased organ donors through the Gift of Life, Michigan. All human tissue used in this work was de-identified and was conducted with approval from the University of Michigan IRB (protocol # HUM00093465 and HUM00105750). Animal experimentation: This study was performed in strict accordance with the recommendations in the Guide for the Care and Use of Laboratory Animals of the National Institutes of Health. All animal experiments were approved by the University of Michigan Institutional Animal Care and Use Committee (IACUC; protocol # PRO00006609). © 2017, Hill et al.